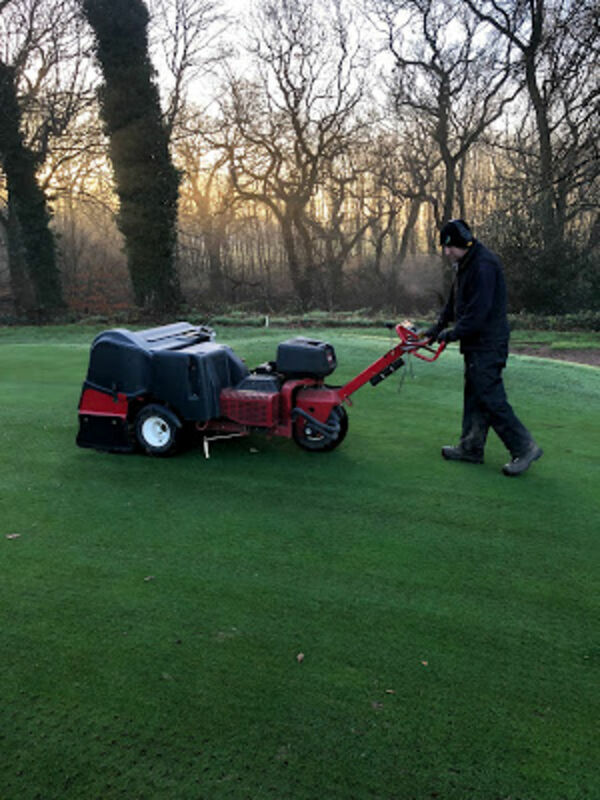 We started the month with cold temperatures and steady amounts of rain, the temperature held us back feeding the greens but we managed to top dress the greens after procore aeration. 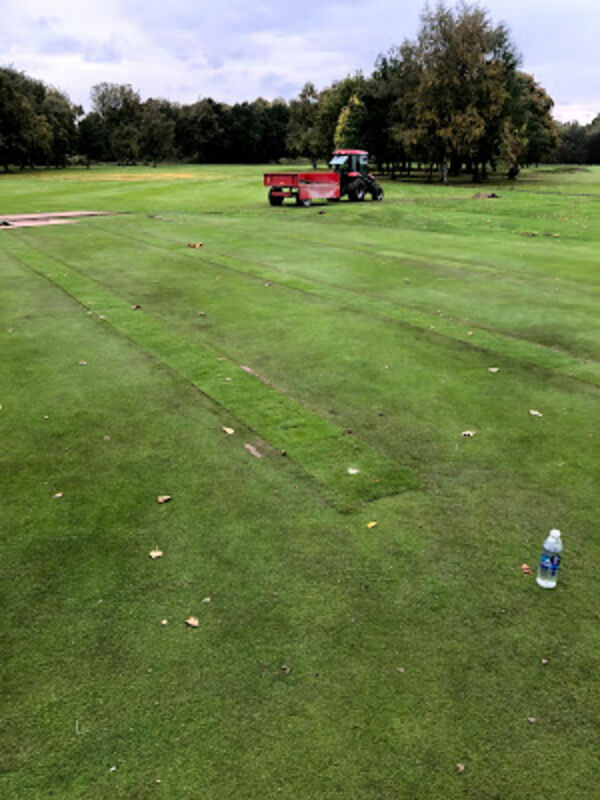 Mallinsons came in to vertidrain the fairways,this work was put on hold after a wet period and the last six were finished off at the end of the month. Greens were sprayed to retain plant health and disease resistance. The pictures below show the work. We hope to feed the greens and continue our program of top dressing throughout April alongside course presentation. 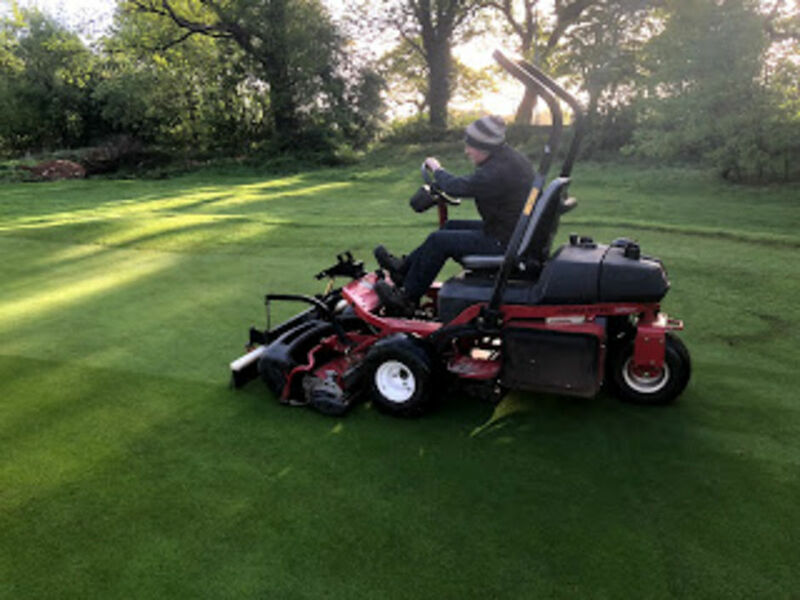 We saw fabulous weather throughout the month that allowed us to shape up the course and get some definition cutting done. The start of the month saw snow!!!!!! 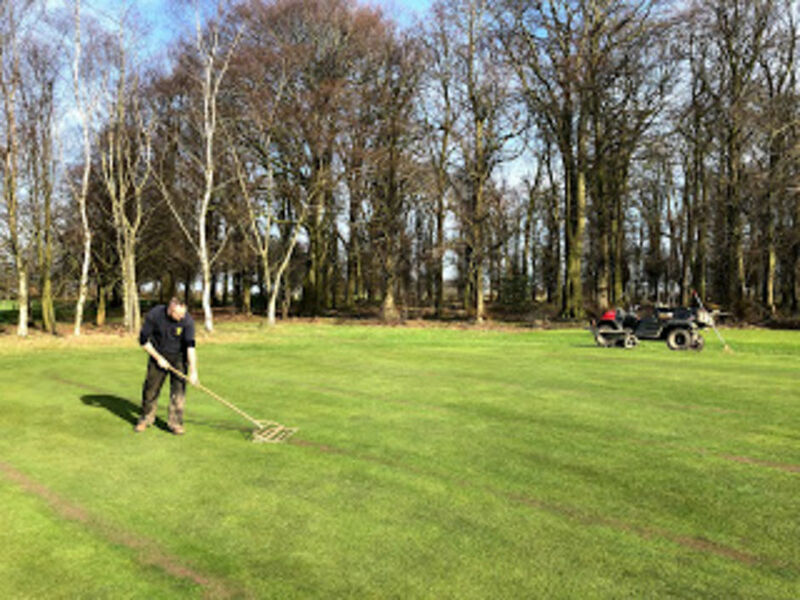 Aeration was carried out on the greens and tees with top dressings carried out on the 2nd tee and 17th/14th green drainage work. Below are a selection of pictures showing the works. In March we hope to feed the greens and tees, and start top dressing greens. Welcome to the January Blog. 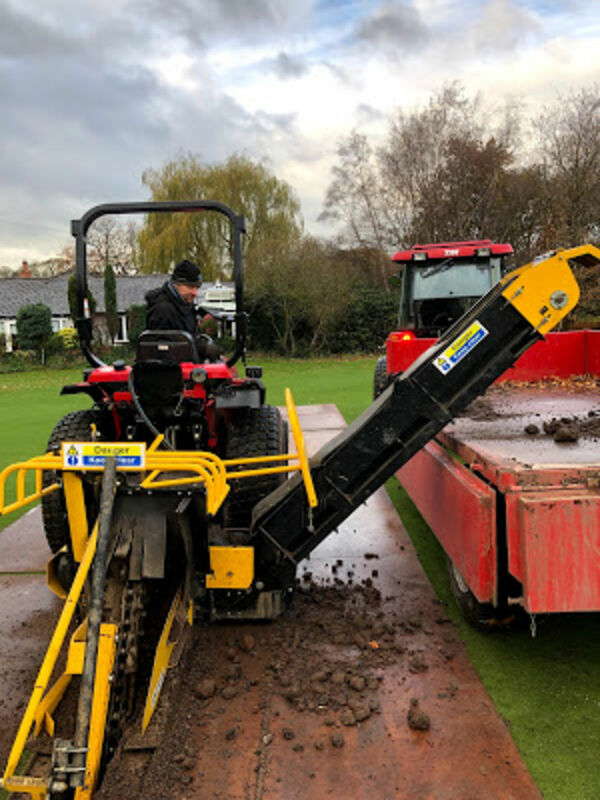 We saw a brief period of sleet and snow but in general the weather was manageable throughout the month, which allowed us to continue on various tasks. The pictures below show some of the work. 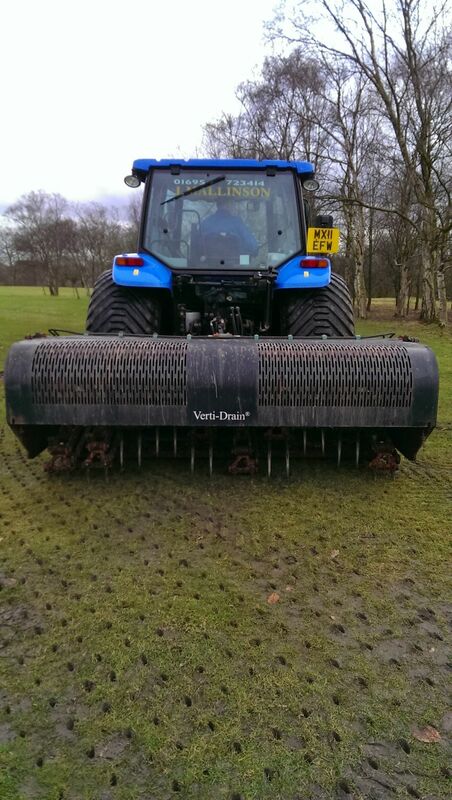 In February we hope to continue with aeration and start to put definition on the course with the mowers. We saw a period of heavy rainfall throughout the month with one day registering 25mm. 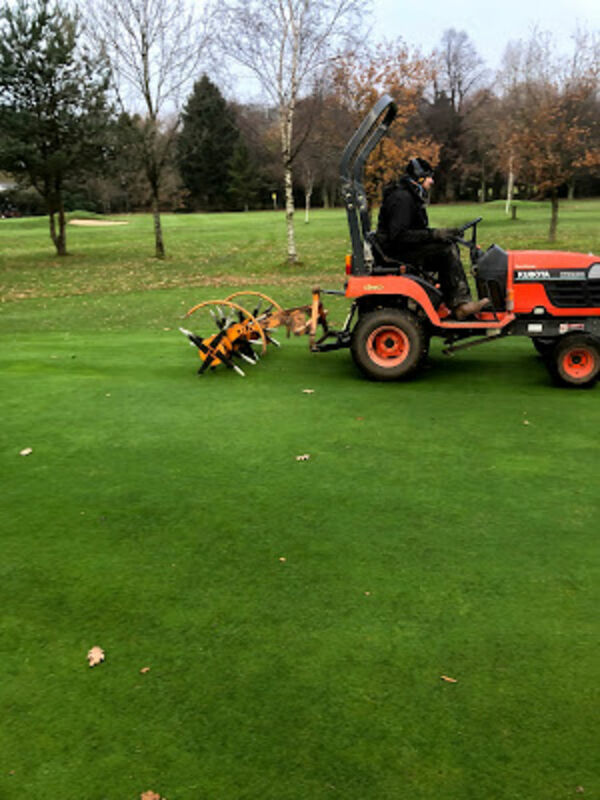 The greens team continued aeration on greens / tees and walkways, we finished off the last of the leaf removal before Christmas. The right hand side of the 8th hole was opened up to bring in play the tee shot to the temporary green. Below are various pictures showing our work. 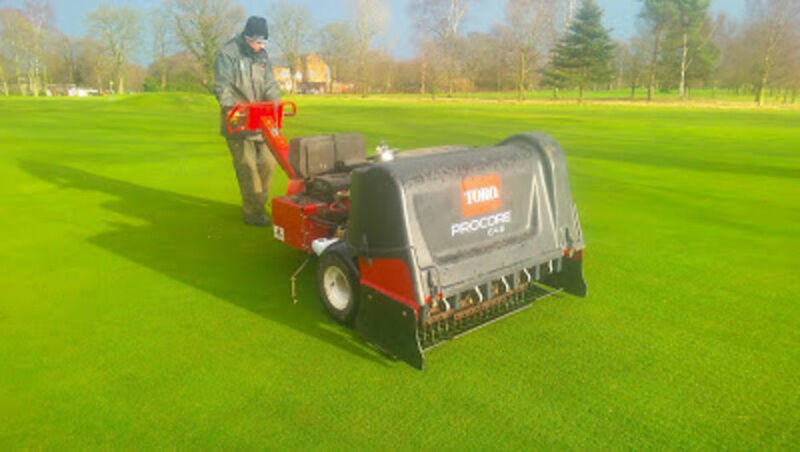 In January we plan to continue aeration and pick up turfing any weak areas around green surrounds and tees. 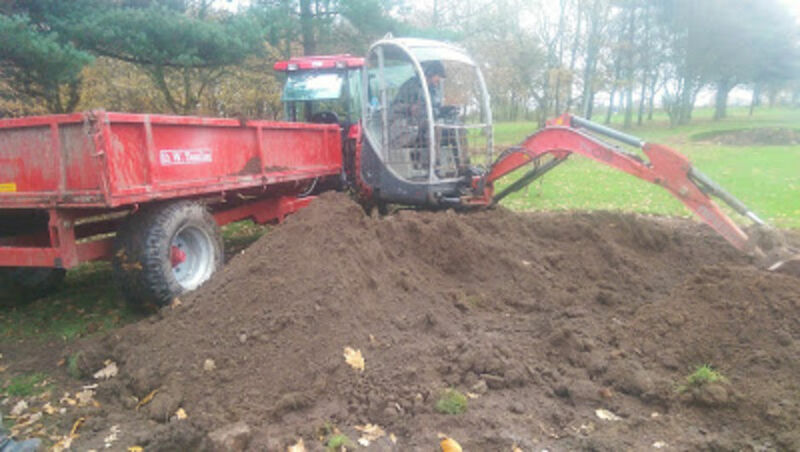 November was busy with various projects taking place on top of the usual course preparation. 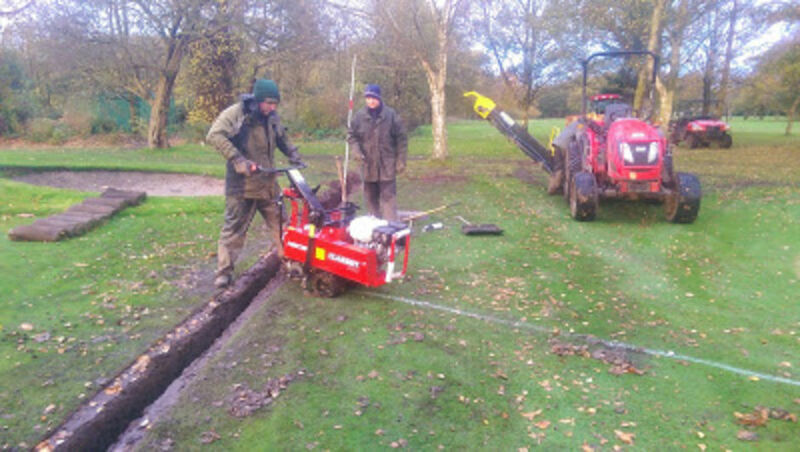 We fitted a new drainage pipe in the middle of the 14th green to try to drain the water away more quickly. 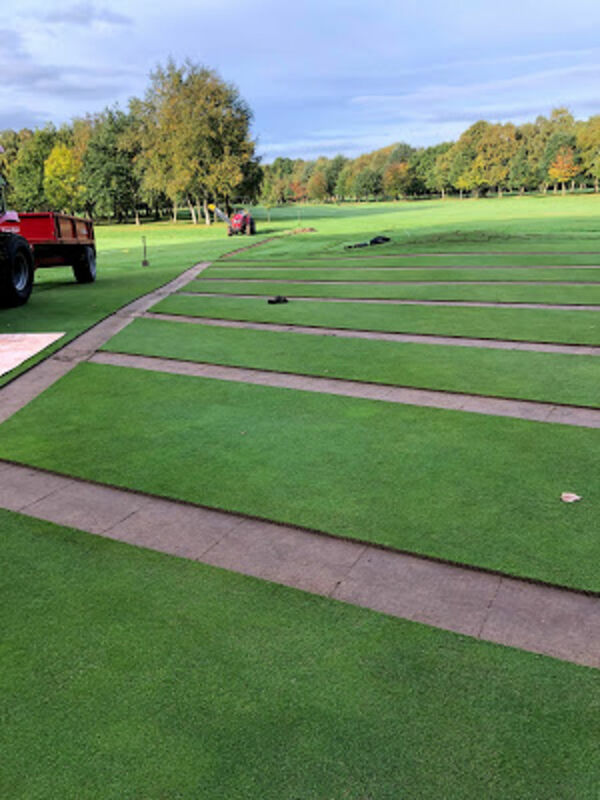 The 2nd tee turf was stripped off and the tee was relevelled,some of the old turf was reused and new turf was laid to finish off the surface. leaf blowing continued has we kept the leaves off the course. In the middle of the month we sprayed a preventative fungicide on to the greens to reduce turf disease from Microdochium patch. 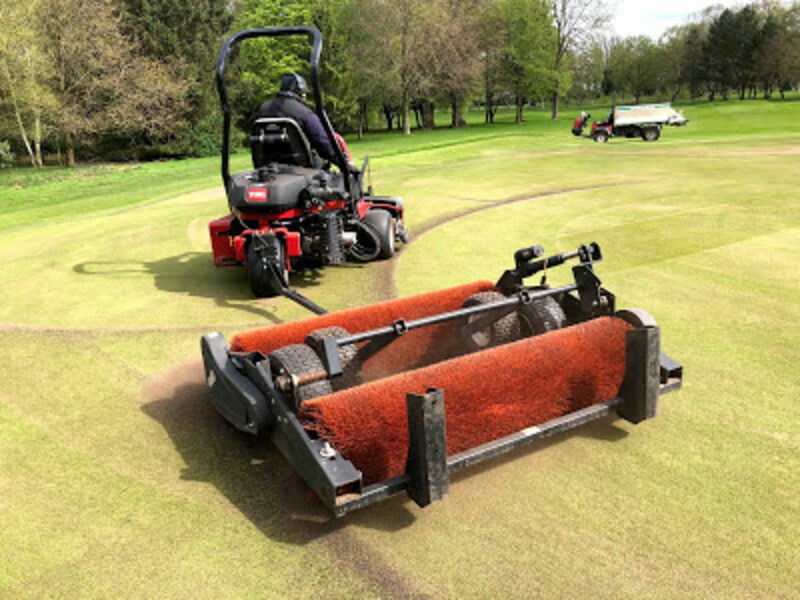 The greens were deep aerated with the soil reliever and rolled to maintain surface smoothness. 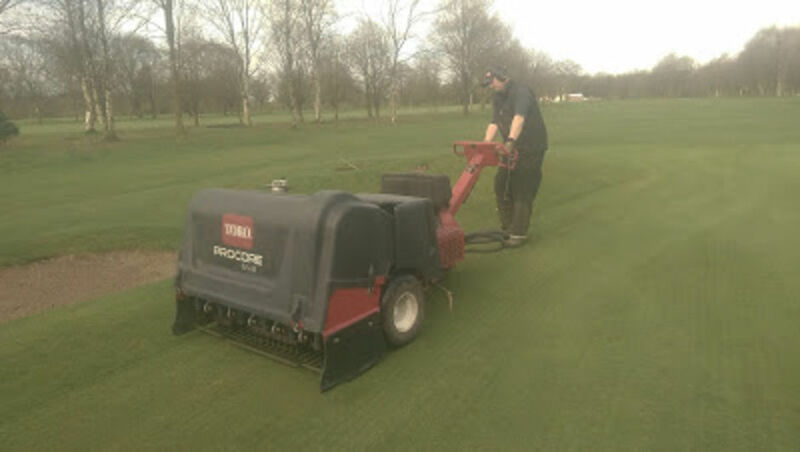 Aeration continued as we use the slitter weekly to keep the greens open and aid drainage. The pictures below show the various works. 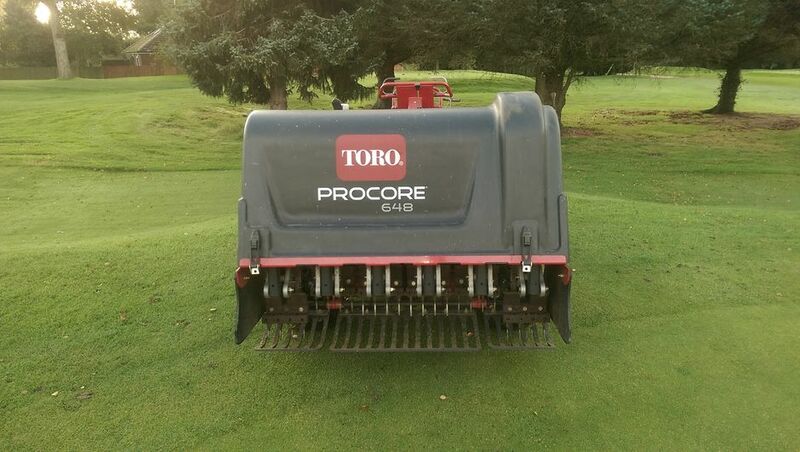 In December we hope to continue with aeration on greens and tees. 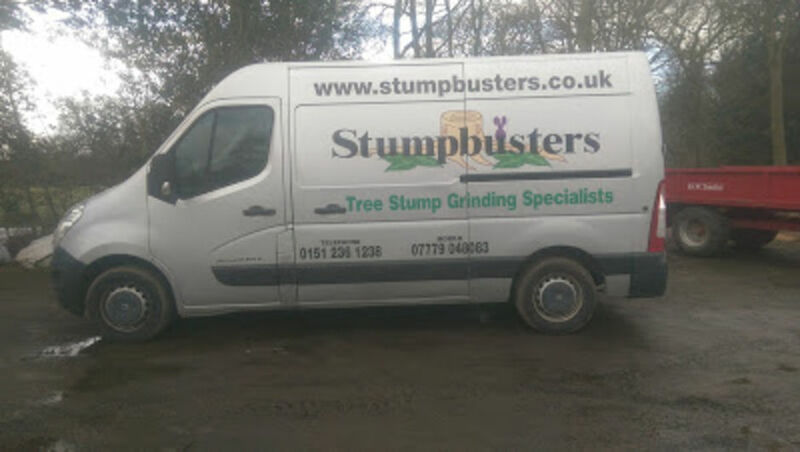 We will start tree work on various holes to reduce trees that are closely planted together, to enable air flow and sunlight penetration to dry out the areas around them, and enable the trees that are left to grow into specimen trees. Welcome to our October blog. The good weather continued as we drained the 17th green. The green had been slow to move surface water from it and after investigation we found minimal drainage. 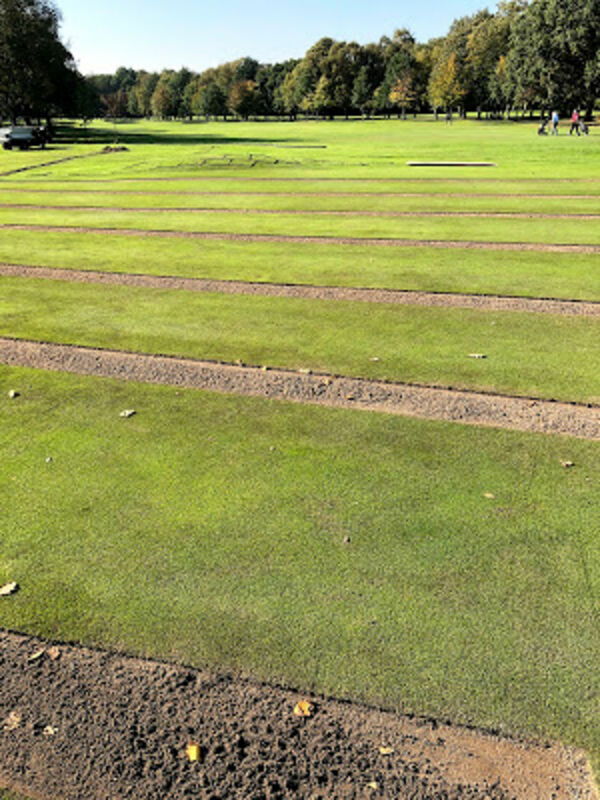 It was decided to install a full system on the green with seven laterals running in to a main.The pictures below show the various stages of the work. 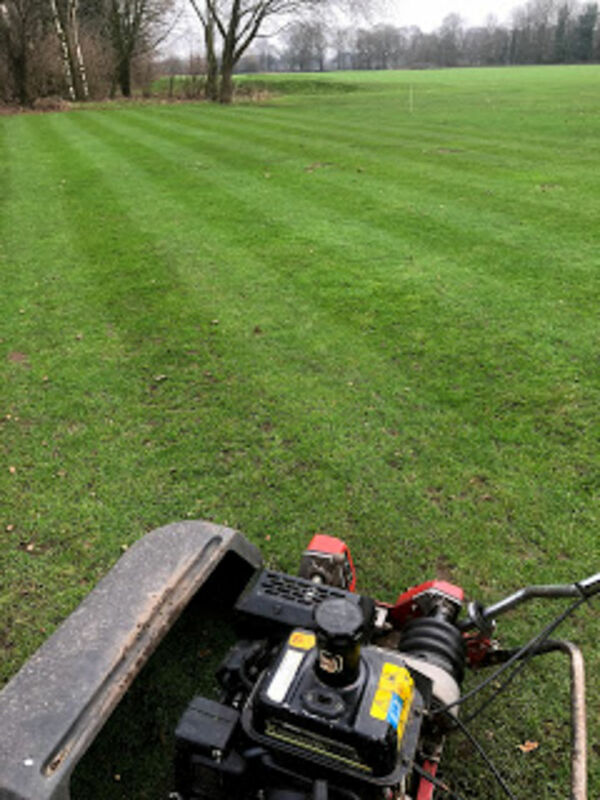 Great work from the greens team to complete the job alongside course preparation in the mild conditions when grass growth continued. 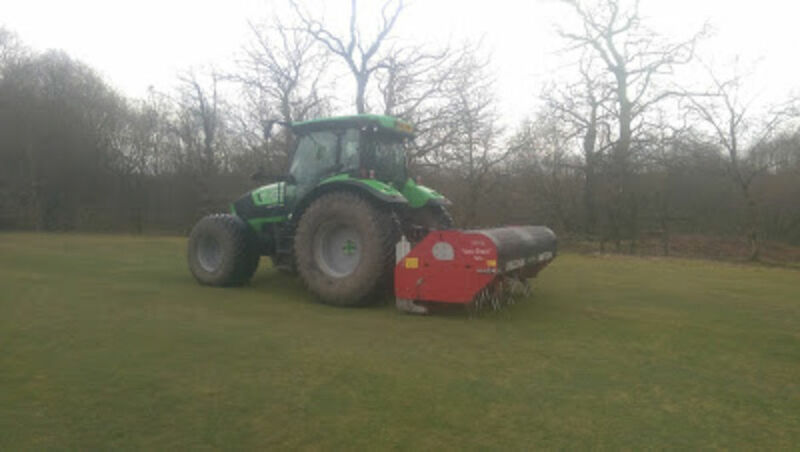 In the later part of the month, Mallinsons came in to vertidrain fairways. 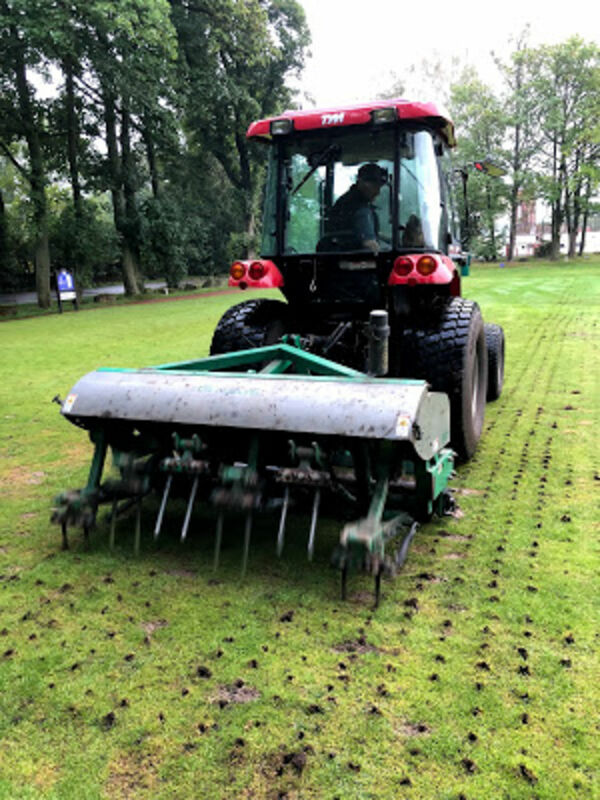 This is essential aeration work that was really highlighted in the dry summer, when it was noted that the fairways coped well in the prolonged dry spell due to the deep root system assisted by the vertidrain program. Welcome to our September blog. As we move into September we see temperatures return to near normal and rainfall reducing the need to irrigate. We overseeded the greens to continue to increase the desirable bent grass in the sward. 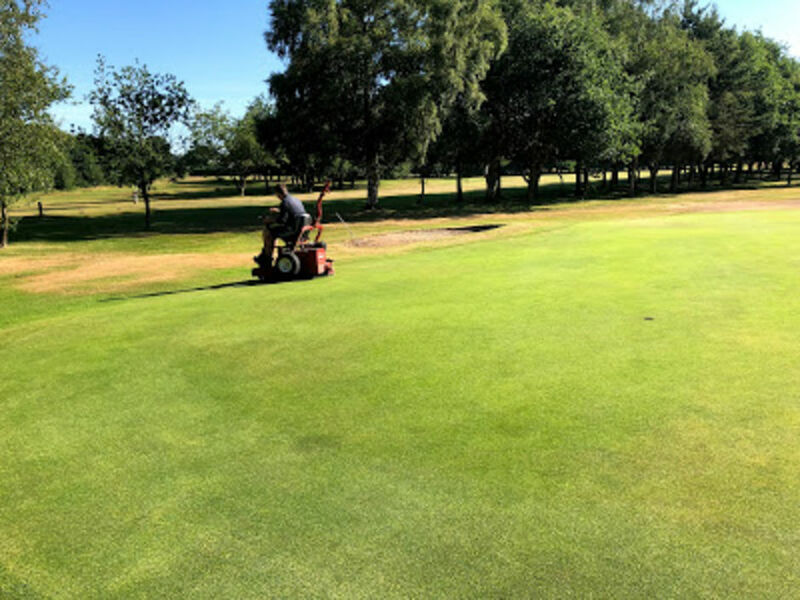 Height of cut have been raised along with the front mounted brushes on the greens machines, which have been lifted until the new plants become established.Towards the end of the month the greens were sprayed with conditioner and iron to harden the plant going in to autumn. 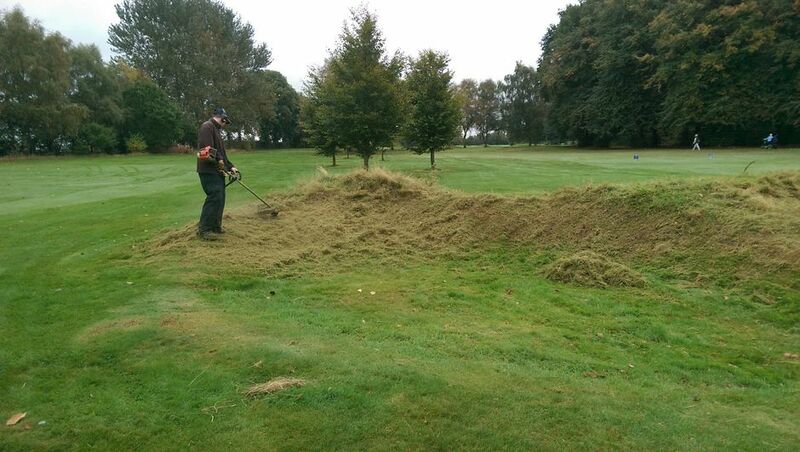 Temporary greens have been cut this is a sure sign that winter is on its way! Below are pictures showing the work carried out throughout the month. Welcome to our August blog. 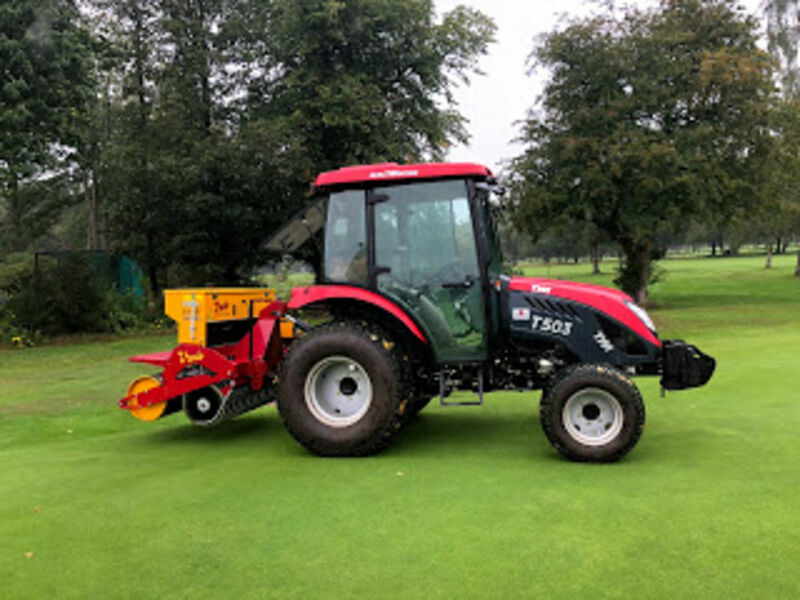 We continued with water management for most of the month and included deep aeration on the greens followed up with our last top dressing of the year, bringing our total up to 120 tonnes. 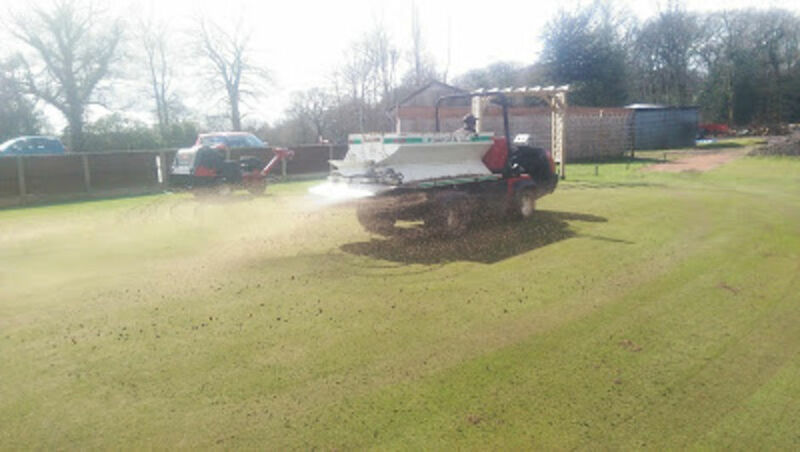 Aeration continued in the latter part of the month with the procore, and with the soil reliever on the tees which were also fed. 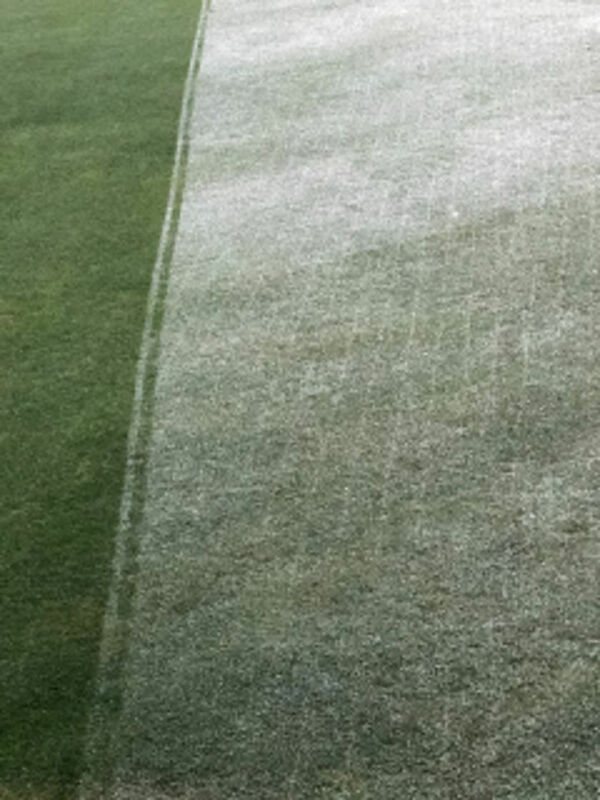 Turf conditioners were applied with the monthly wetting agent. Welcome to our July blog. 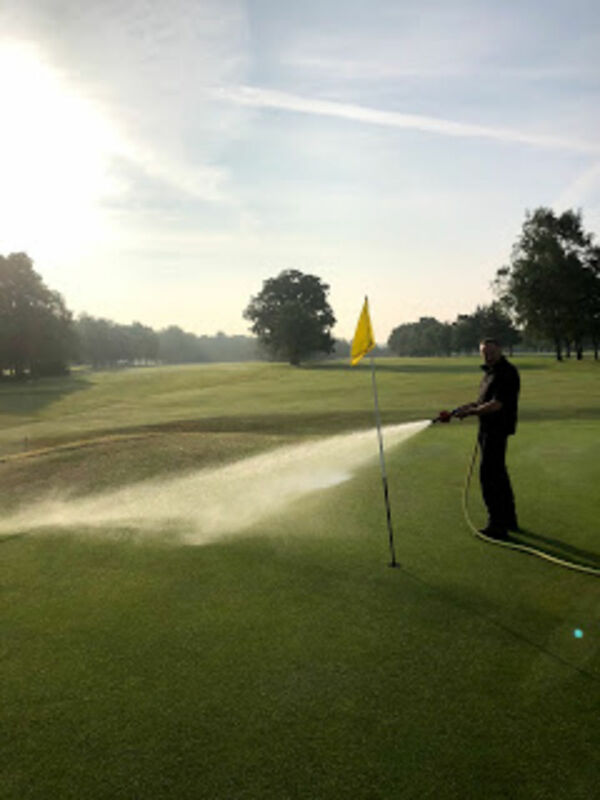 The weather really hotted up throughout the month with the team focusing on irrigation on the greens and tees. 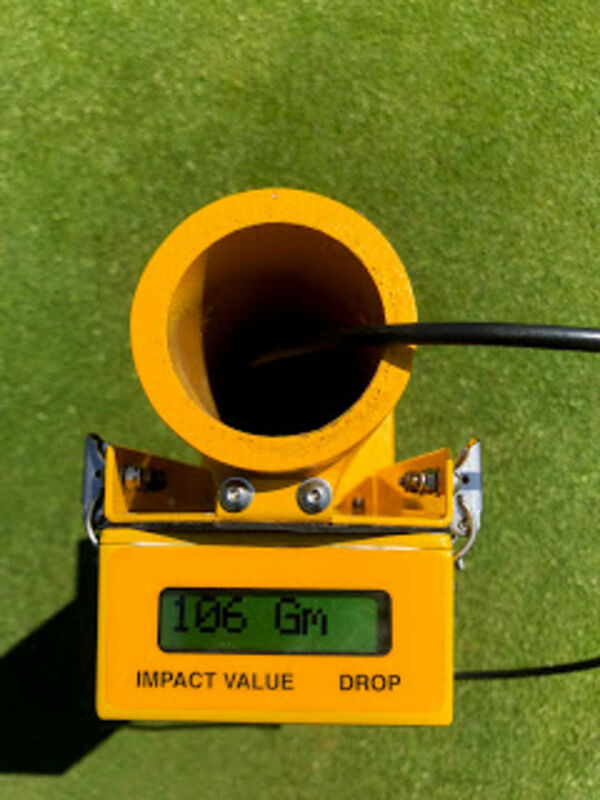 One of the pictures below shows the theta probe that we use to measure moisture levels in the upper profile of the rootzone showing 24.8%. We work within the range of 15% - 30%. 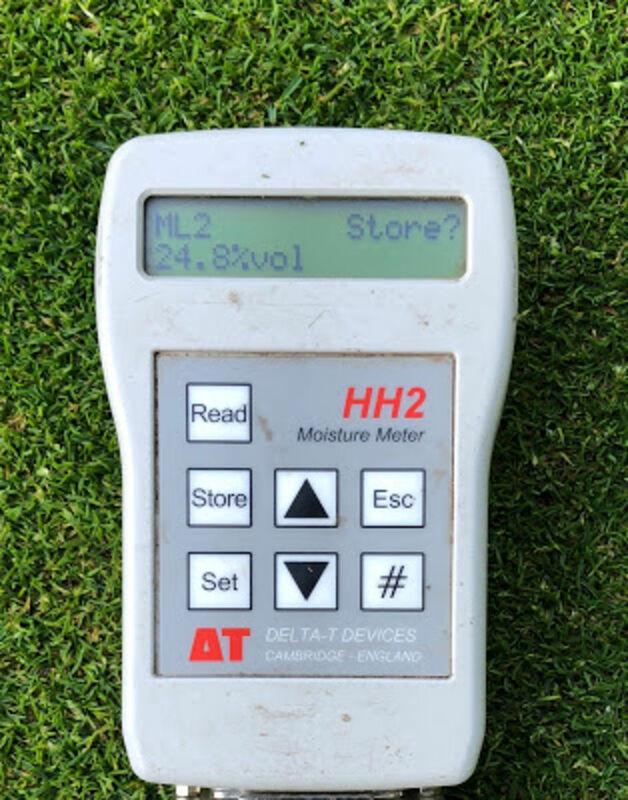 this range enables us to keep the turf healthy in dry conditions. 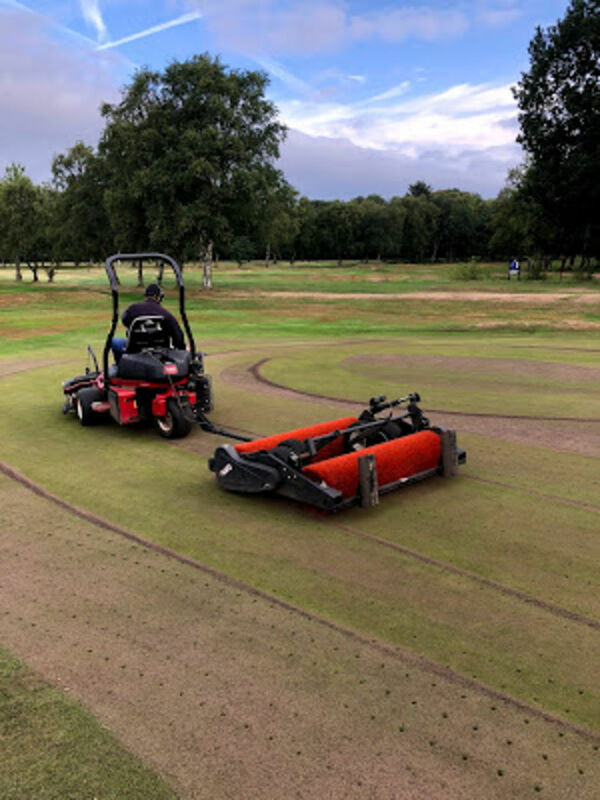 It should be noted that the fairways held up really well in the prolonged dry period showing the benefits of deep aeration with the vertidrain. This work enabled deep roots to develop in the plant enabling it to cope with the heat stress. Below are photographs showing the work carried out in the month. 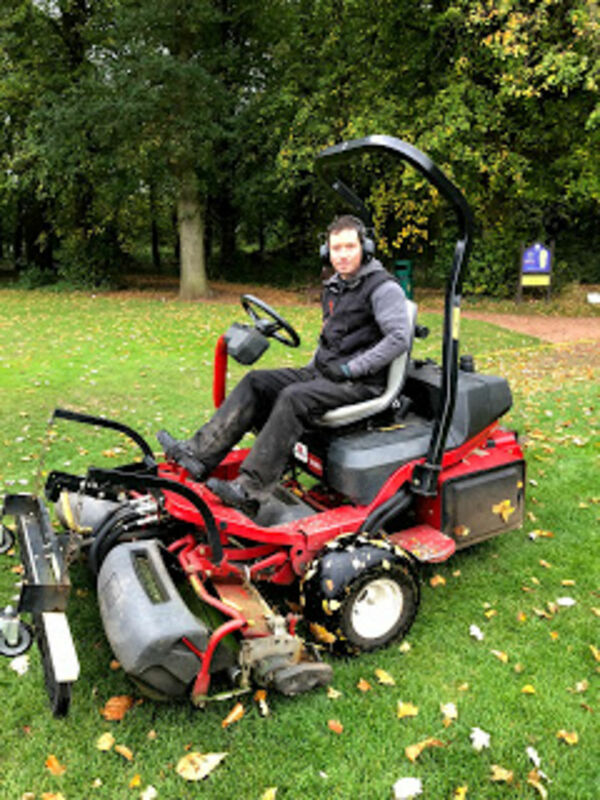 Rob has a wealth of greenkeeping experience and will be a valued member of our staff. We wish Rob every success in his new position. Welcome to the June blog. The weather has started to warm up as we move into June, wetting agent applied to greens along with aeration and top dressing. We.started using the irrigation system and watering by hand. 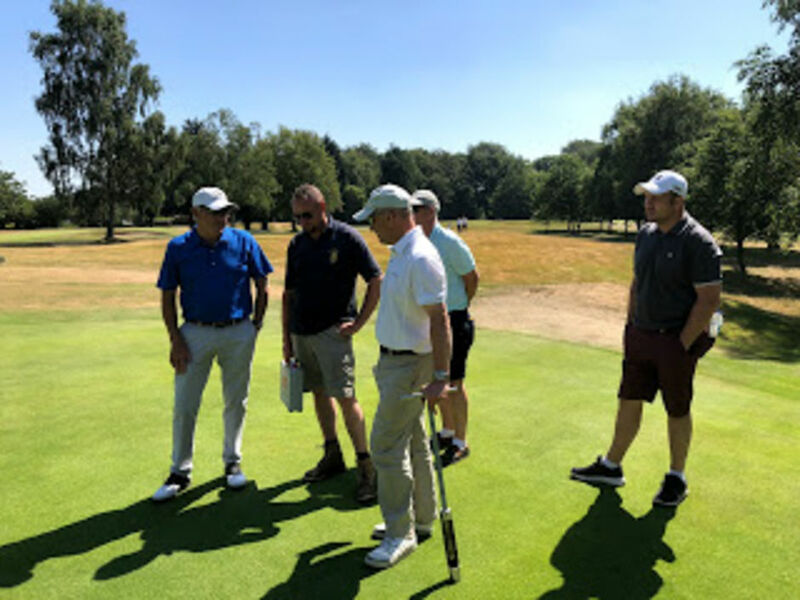 We had our annual visit from Mr Alistair Beggs from the Sports Turf Research Institute to review conditions on the course and to offer advice on management and various works. The visit was very positive with the work programme aiming to raise the quality of surfaces and course presentation. Below are photographs of the work carried out throughout June. The picture above shows the greens team on Chris Lewis's last day at Haydock Park. 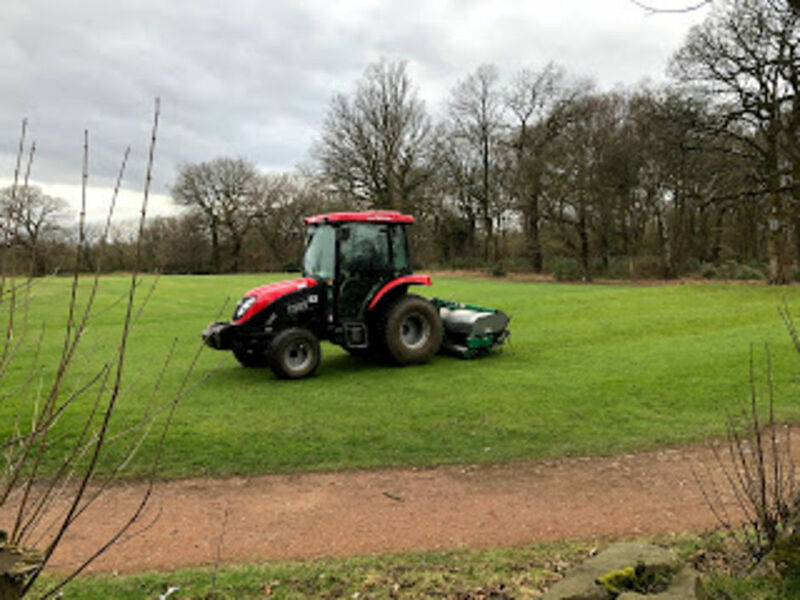 Chris has continued in greenkeeping moving to the Worsley Marriot in Manchester. Chris is pictured third in from the left of the picture. We wish him every success in the future. Mr Alistair Beggs pictured with the course management committee. Welcome to the May blog. We move into May with an early morning frost accompanied with the regular rainfall. 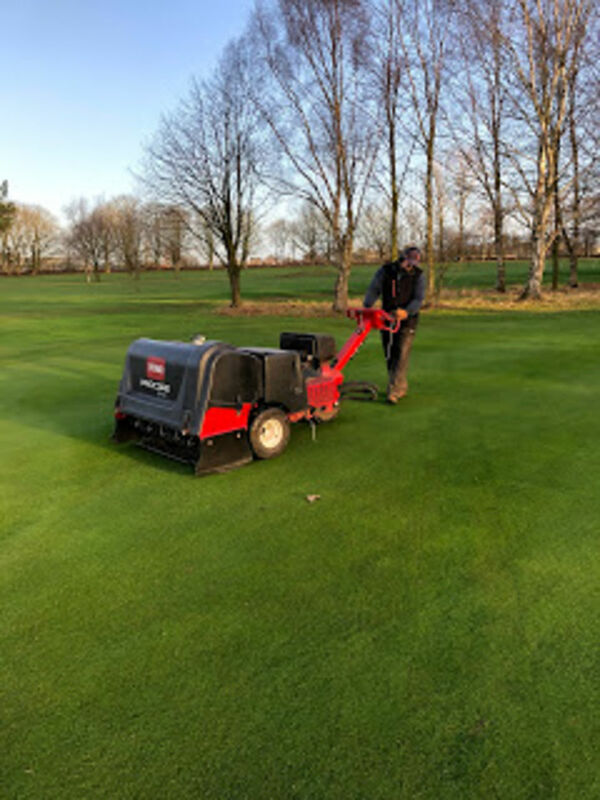 Heights of cut are gradually being lowered on most cutting machines, with aeration and top dressings on the greens continuing. Greens have been fed with 4 0 8 invigorator and wetting agent applied, moisture levels are being monitored. Pictures below show various work. Welcome to our April blog. The beginning of the month showed regular periods of rainfall, however we continued our greens top dressing program. Greens were procored to continue the regular aeration work along with the continued applications of Revolution wetting agent. 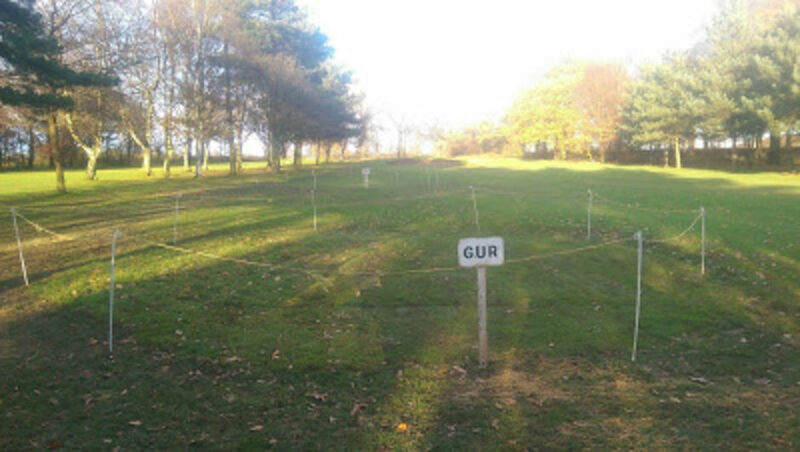 Paths were shaled along with general course preparation being raised as the days started to become longer. Below are photographs showing the works. Welcome to the update. 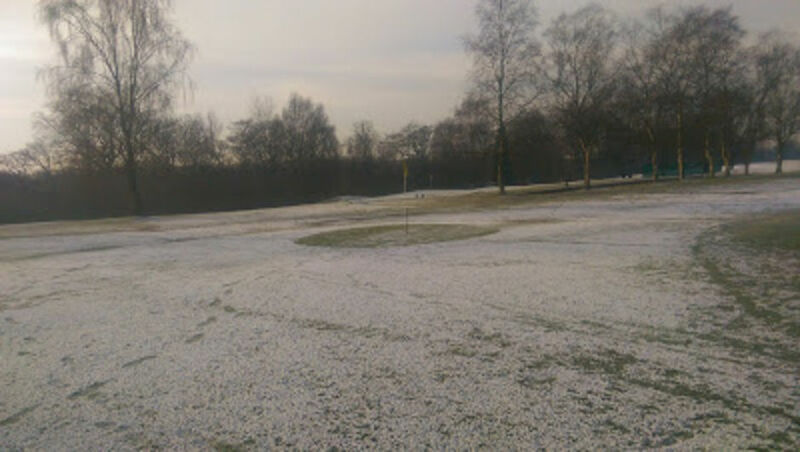 We've seen a variation in weather conditions throughout the month with bitterly cold winds, frost and snow covering the course for a brief period. 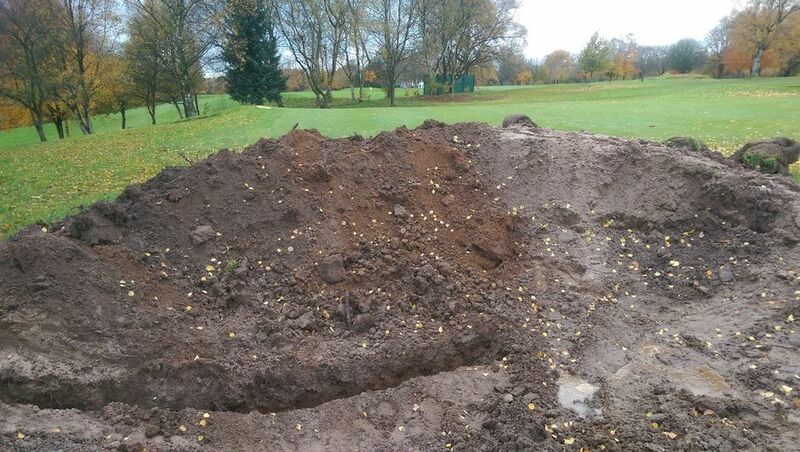 A Moderate amounts of rainfall was deposited on the course, 65mm in total. 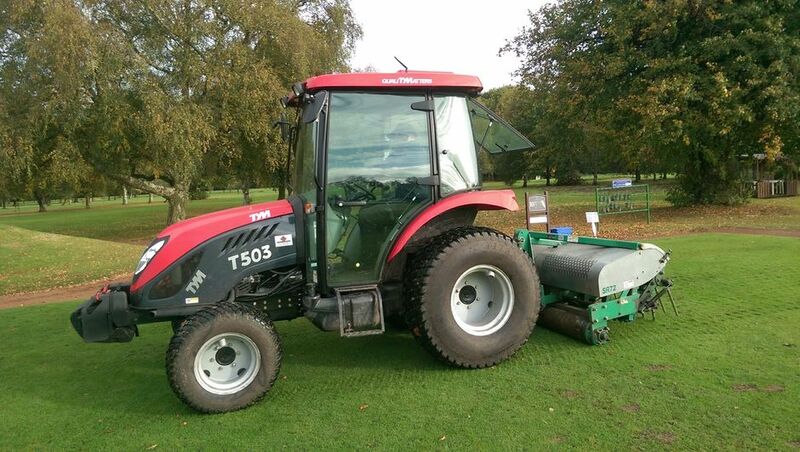 Mallinsons came in to vertidrain the fairways, and deep aeration was carried out on the tees. The stumps from the tree work were removed, we managed to aerate and feed the greens and tees and top dress the greens. Below are photographs showing some of the work carried out throughout the month. 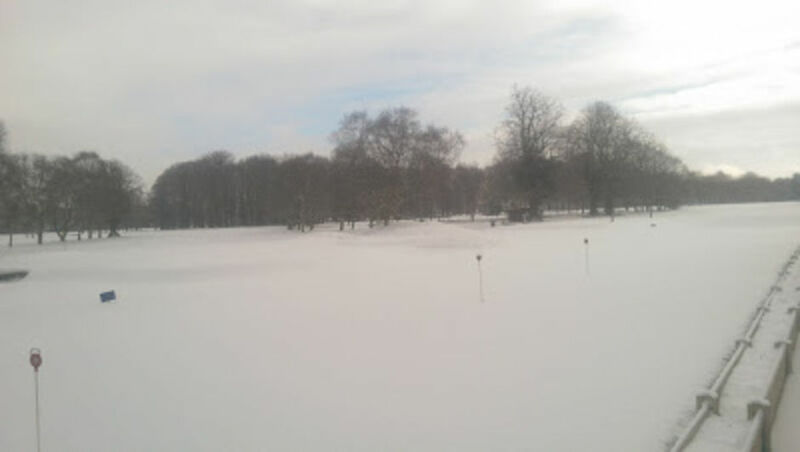 Let's hope we get some decent weather in April to help us prepare the course for the start of the season!! 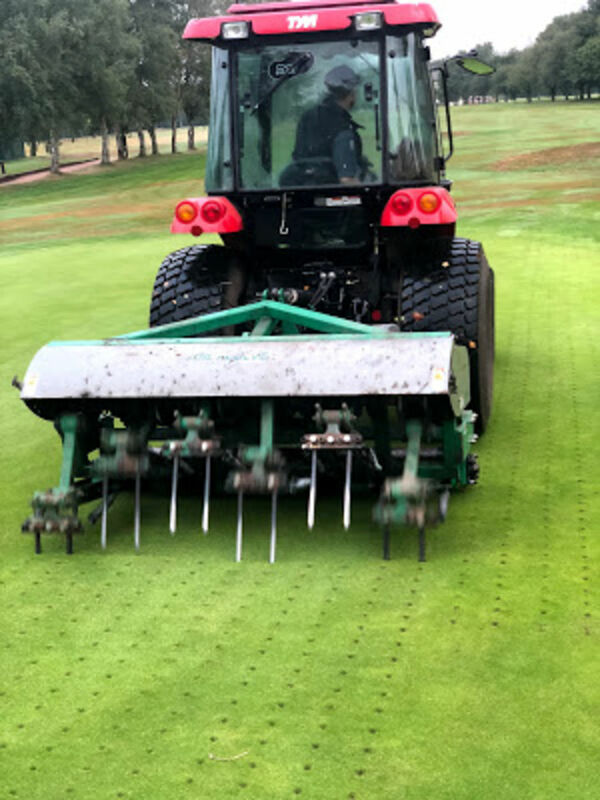 The rainfall continued throughout the month, however a brief period of dry weather gave us the opportunity to deep aerate the greens and top dress. 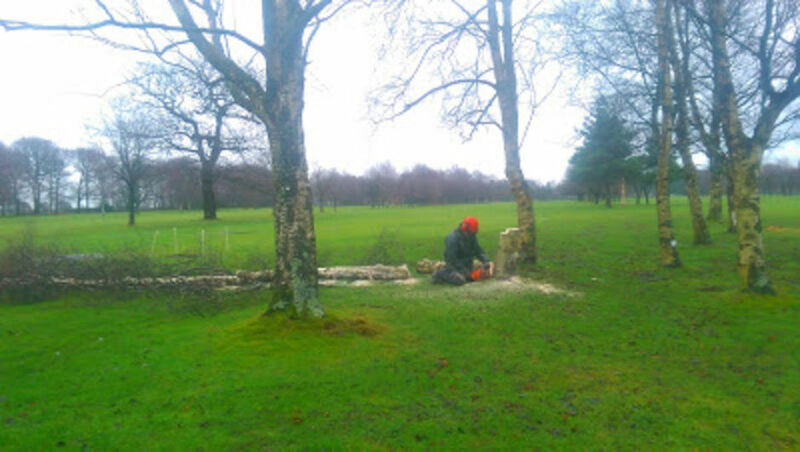 Tree work continued and we managed to complete the bunkers at the 7th hole. We also had a good covering of snow and the start of a cold period. The photographs below show the work. 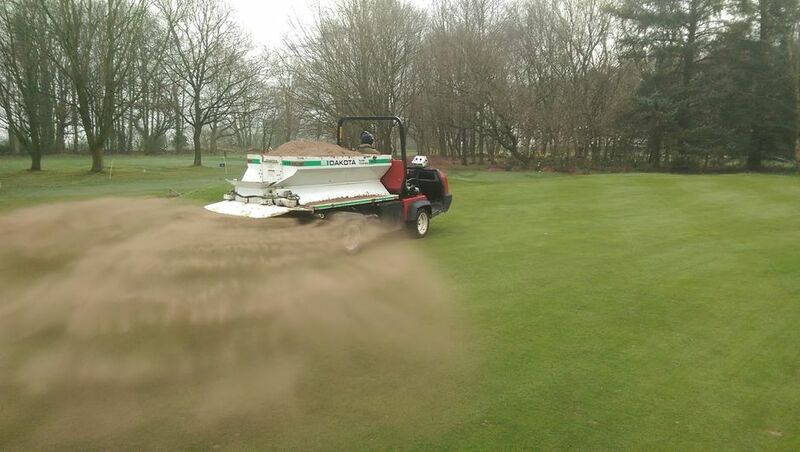 We will continue aeration and look to apply a fertiliser to the greens and tees. 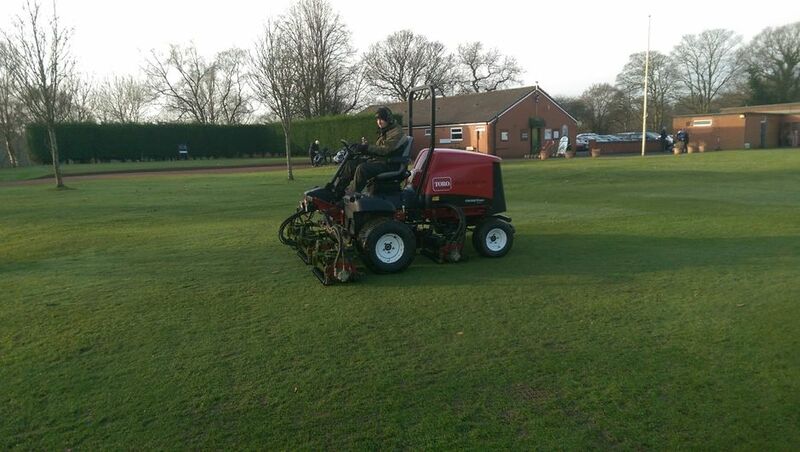 Mallinsons will be vertidraining the fairways and we will be shaling the paths for the start of the season. Welcome to our January blog. The weather continues to dominate our programme with heavy rainfall occurring regularly throughout the month with a figure of 133mm. 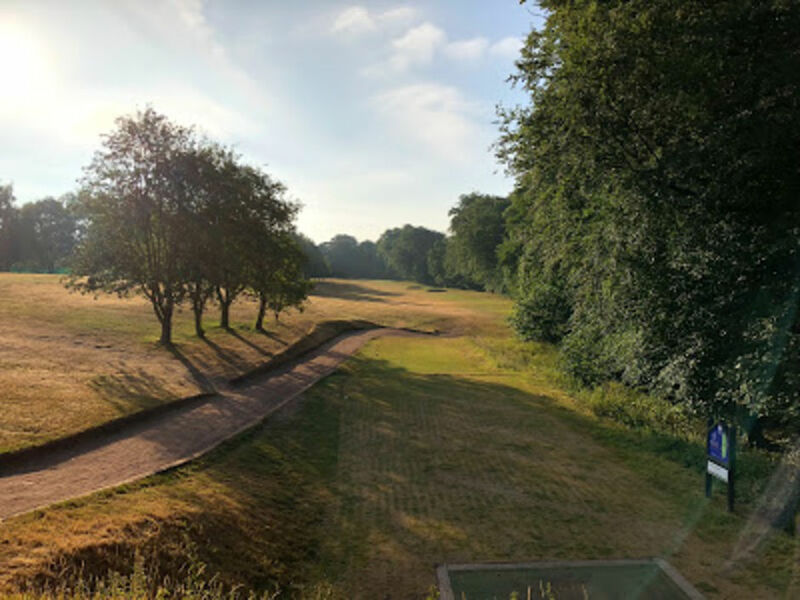 The greens team managed to work on the 7th greenside bunkers, start the tree work on various areas around the course and continued aeration on the greens. Below are a selection of photographs showing the work. 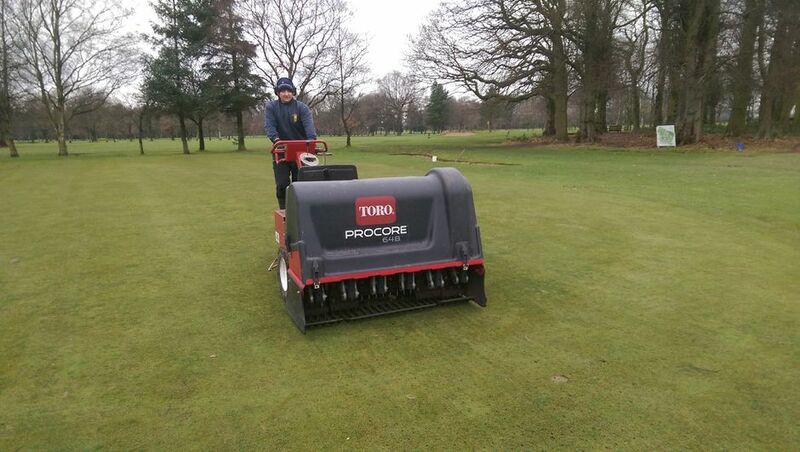 We move in to February with aeration on the greens being important after the constant rainfall over the past month. 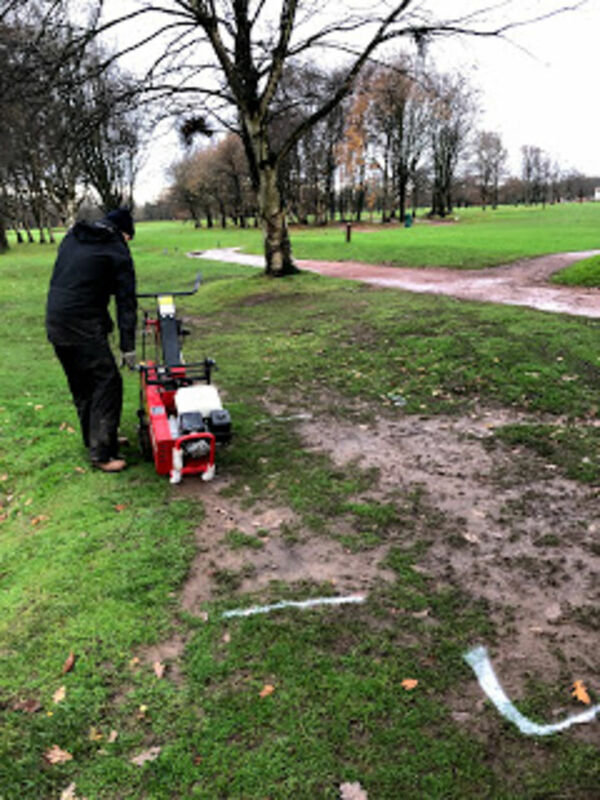 We continue to be discussing the periods of heavy rainfall, which totalled 127mm and made managing the course tricky, with damage limitation being the order of most days. .Aeration on the greens has continued,and the tee's have been cleaned up with a cut to aid presentation. 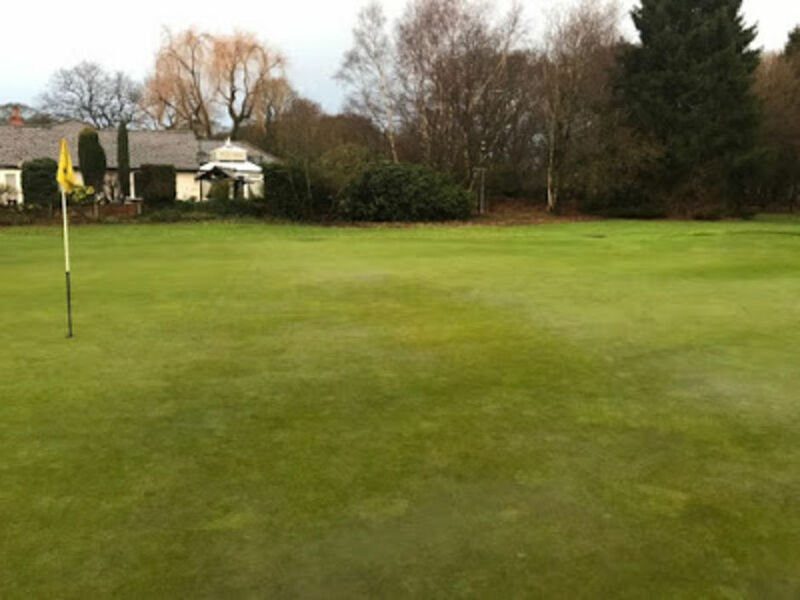 In mid December we had a brief period of frost which whitened the grass for a short period and the flags were took off the main greens and put on the winter greens. Below are photographs to show some of the work. 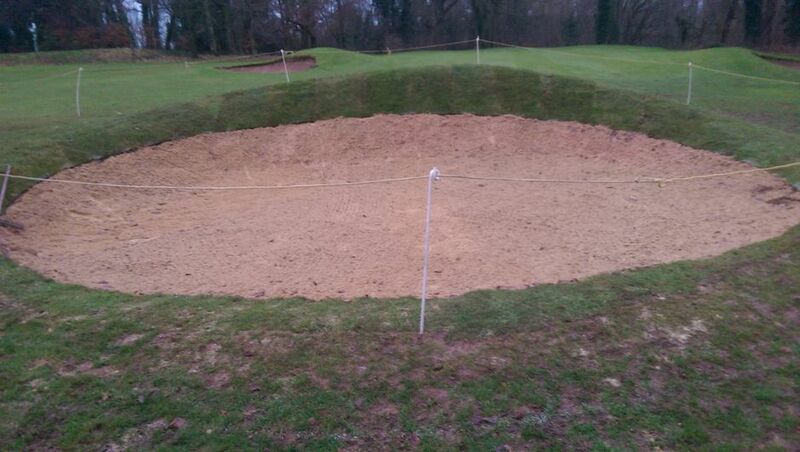 We will finish off the bunkering on the 7th hole, the drainage work on various parts of the course will be completed. 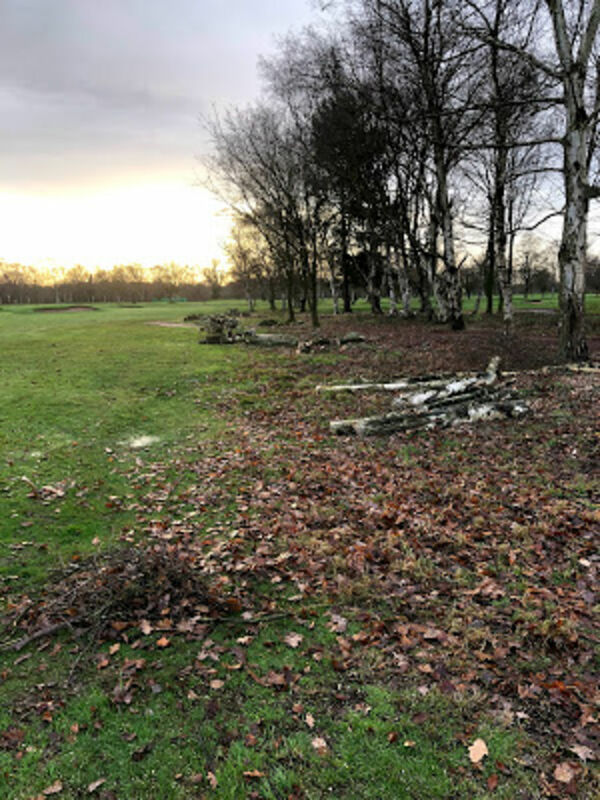 Tree work will be tackled in the early part of the month, where we aim to thin out copses to allow individual trees to flourish and in doing so will create better air flow and sun penetration to dry out areas around the course. The benefits of the work will be noticed in spring when the trees come into leaf and will give better definition to the landscape. We managed to complete numerous tasks throughout the month with the weather still hitting us with heavy rainfall, totalling 113mm. 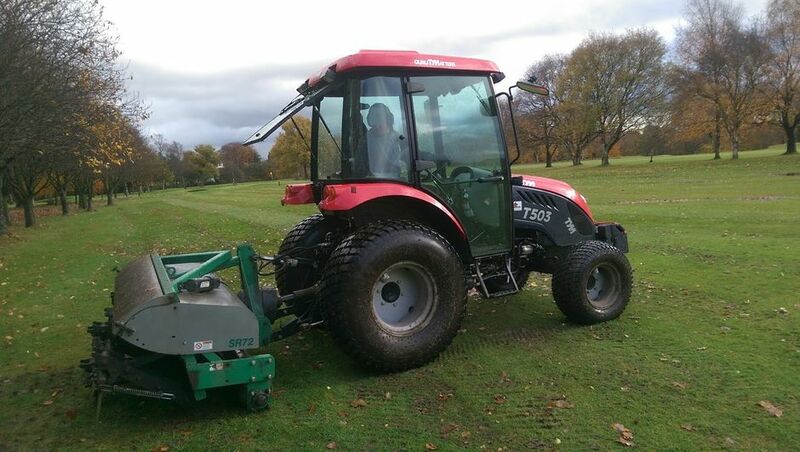 Aeration continued on the greens with weekly slitting, collecting leaves gathered momentum with plenty falling. 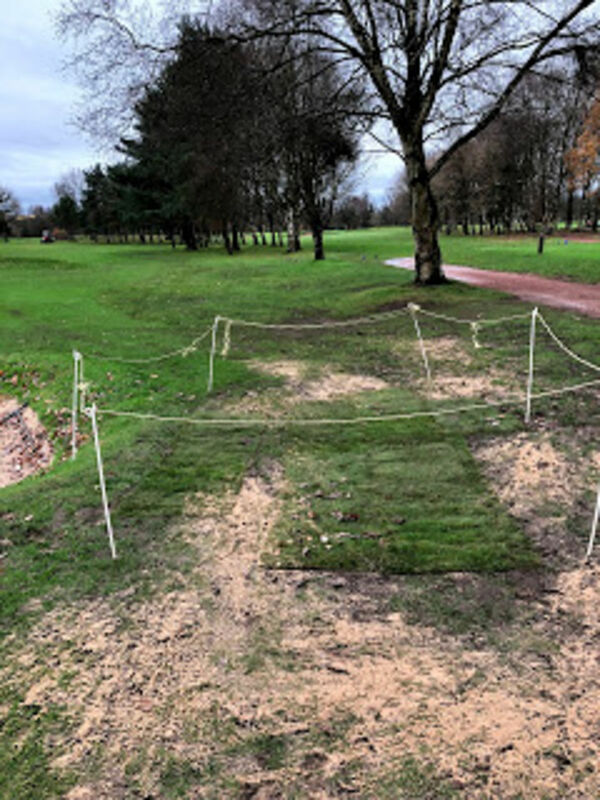 We started work on reshaping the 7th hole with bunker refurbishment on all of them,the fairway bunkers have been taken out due to health and safety issues with the adjacent busy road. 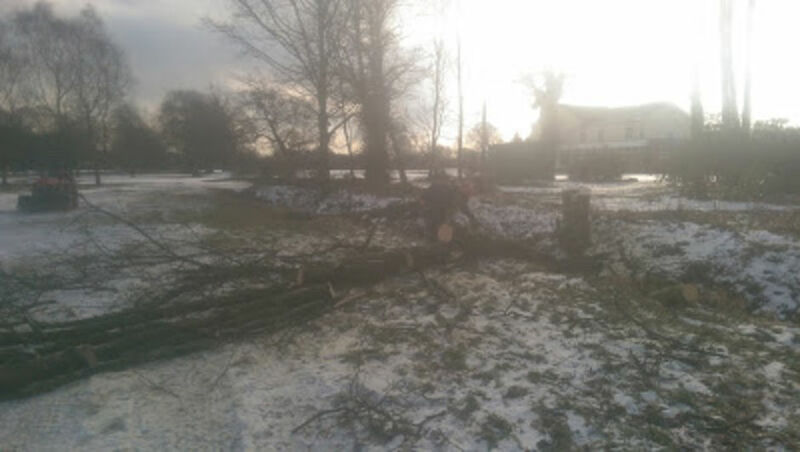 We started to remove trees in various parts of the course that had been planted too close together causing numerous problem, some of these being heavy shade around the greens, root damage to the drainage systems and badly shaped trees with minimal growth on one side of the canopy. 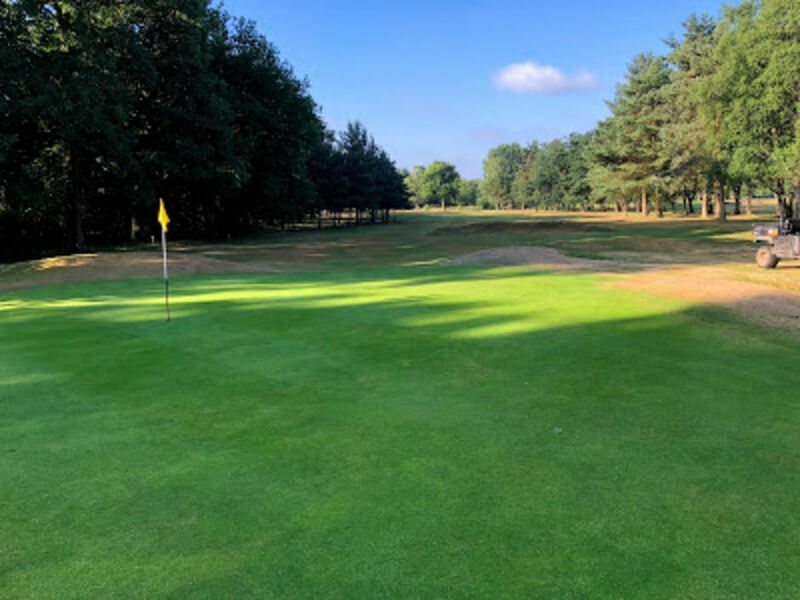 The golf course needs all areas to receive good airflow and sunlight penetration to aid drying out which will enable better growing conditions. The pictures below show some of our work throughout the month. We will continue with greens aeration and removing leaves off the course, and continue with bunker work on the 7th hole. 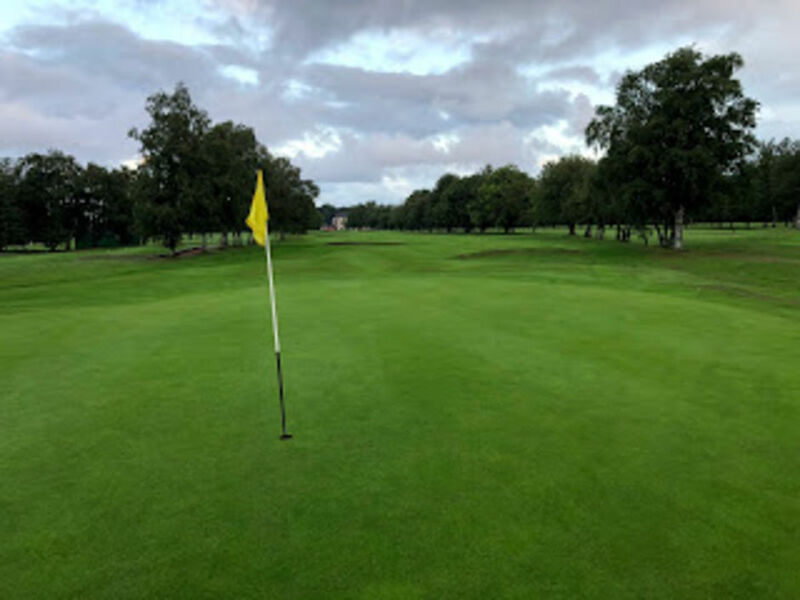 The weather played a large part in our work progress throughout the month with regular periods of rainfall,however we managed to complete various programs to move us along into the autumn/winter period with 129mm of rainfall. 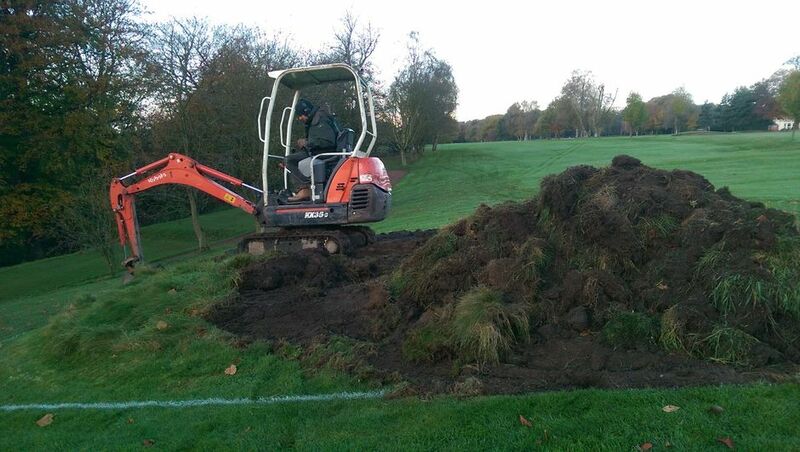 Drainage work was carried out in front of the 18th green to aid water movement in problem areas. The pictures below show some of the work that was carried out throughout the month. Preparing the area at the18th green surround for drainage. Aeration will continue on the greens,leaf collection will be continuous throughout the month, and we will start bunker work on the 7th hole. We continue to discuss the unpredictable weather patterns as we head in to Autumn. 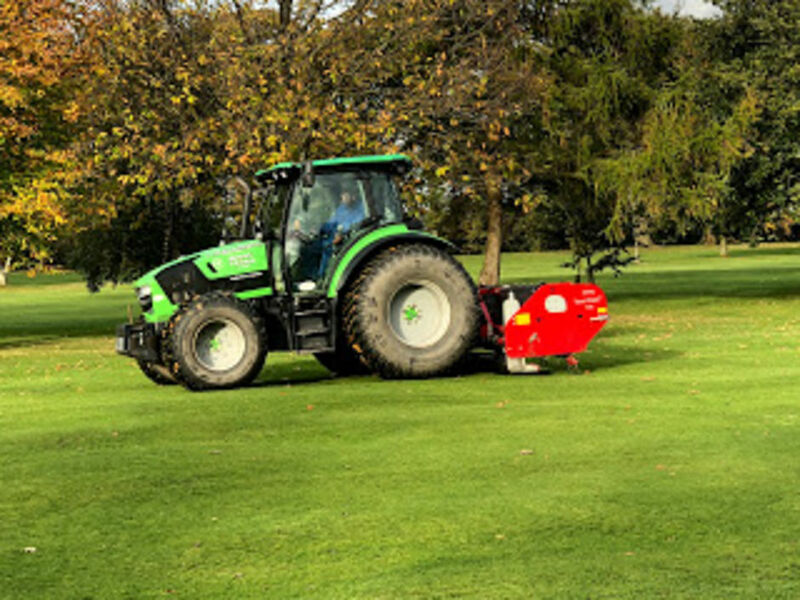 Historically September was regarded as a dry month where fairways could be scarified and deep aeration could be carried out that would benefit the course moving in to the winter period. Unfortunately the continuous rainfall restricts the work from being carried out,and we look for windows of opportunity. 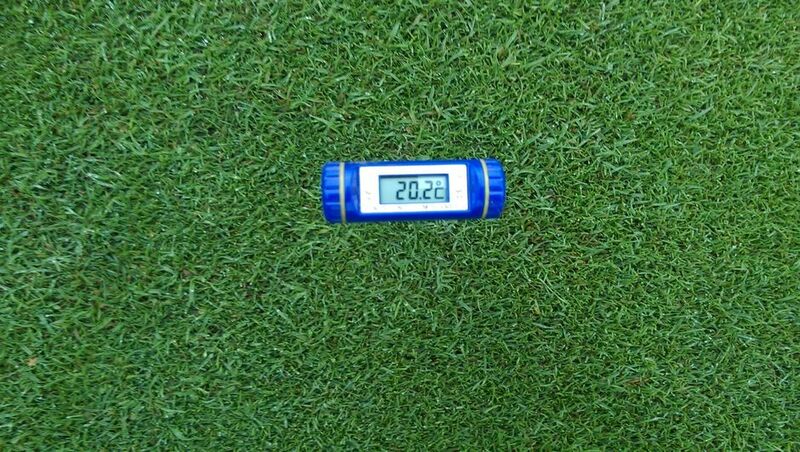 We overseeded the greens in the early part of the month and saw good germination after ten days. The mounds on the 13th /15th/17th were cut short and raked up. 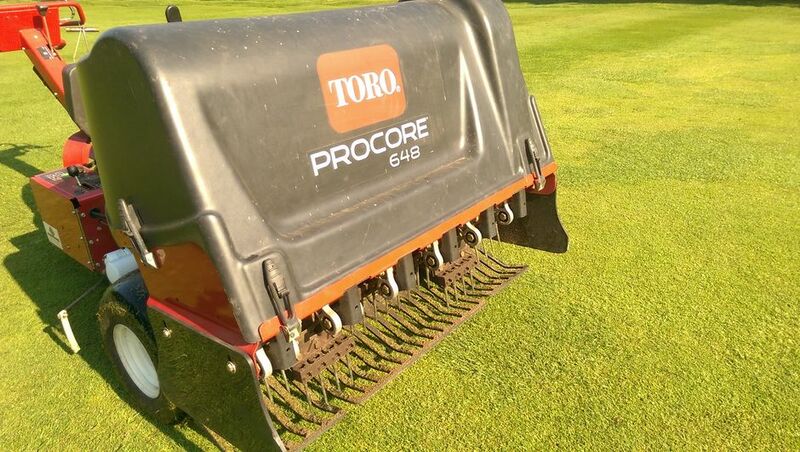 Later in the month we aerated the greens with the procore. Photographs below show the various works. 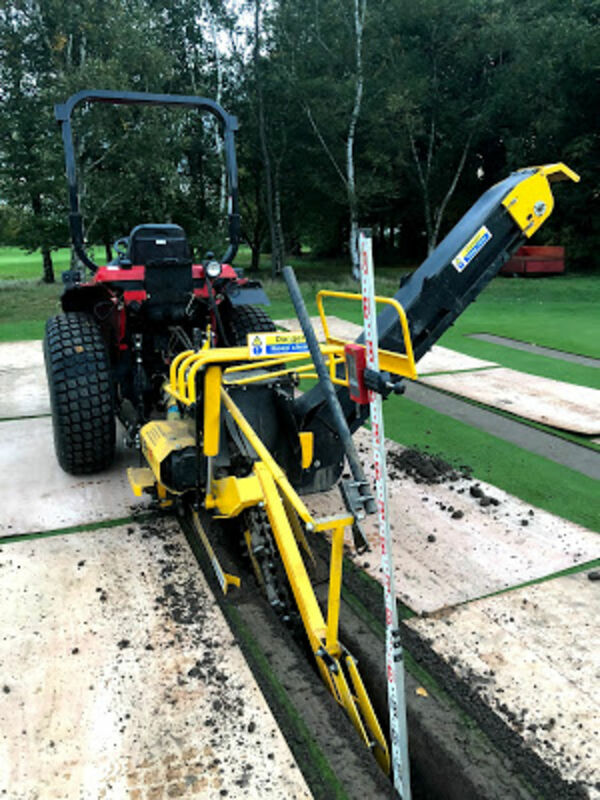 We have discussed various projects for the winter programme, drainage on problem areas will be carried out and we will look to thin out heavily planted areas of trees that restrict sun light, air flow and cause root damage to the drains. 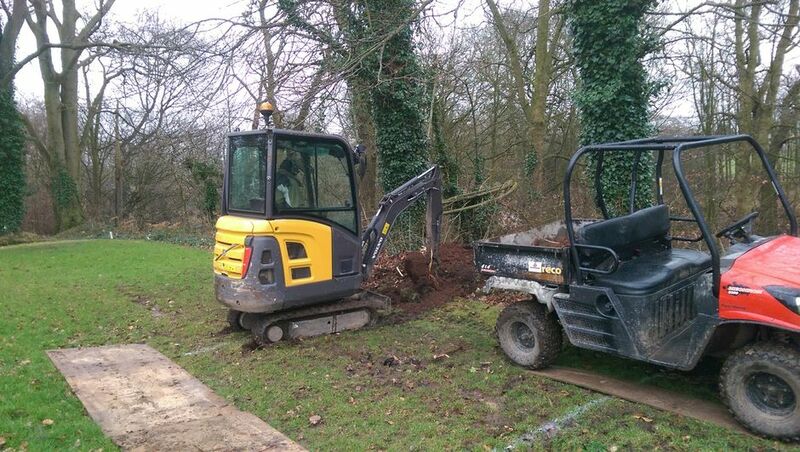 We aim to allow the specimen trees to flourish by giving them space to develop. 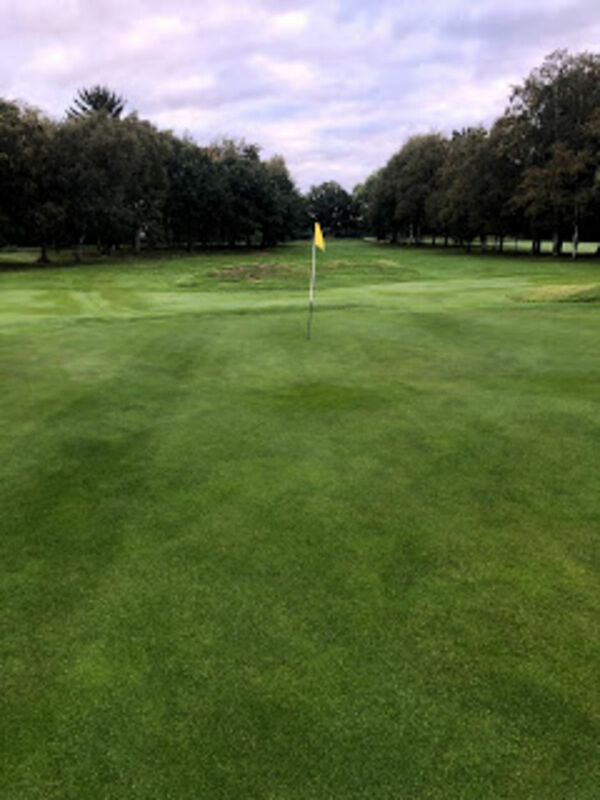 Over a period of time we will look at these correctly managed areas and see the long term benefits with areas drying out and the ground surfaces becoming more playable throughout the year. We will target bunker maintenance on all the bunkers on the 7th hole,reducing overhangs improving drainage and positioning bunker mat. 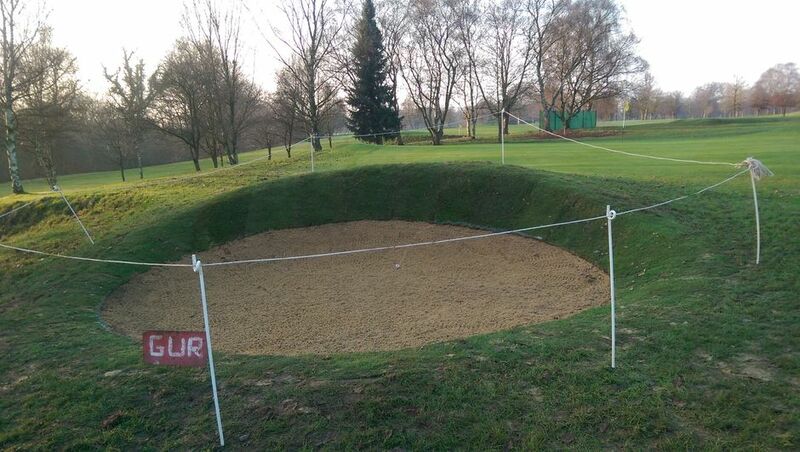 The bunker mat will improve sand quality and reduce contamination from existing soils. We continued with periods of rain throughout the month with a rainfall total of 77mm. 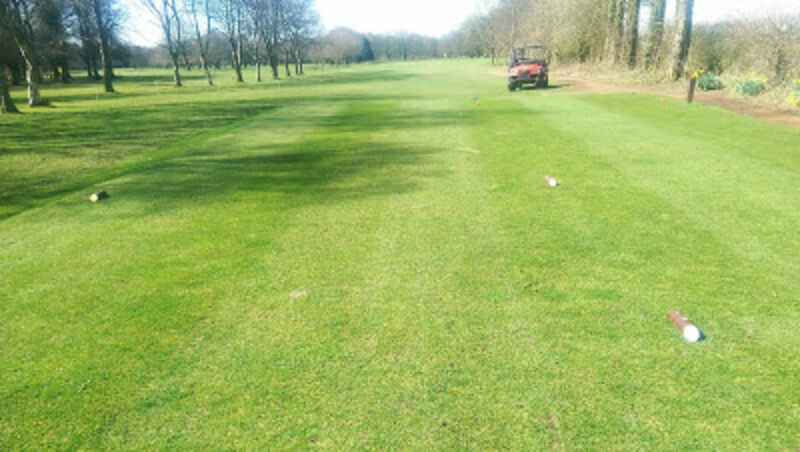 Course presentation was helped with blowers used across the course to disperse the wet grass from the rough and fairway cutting. 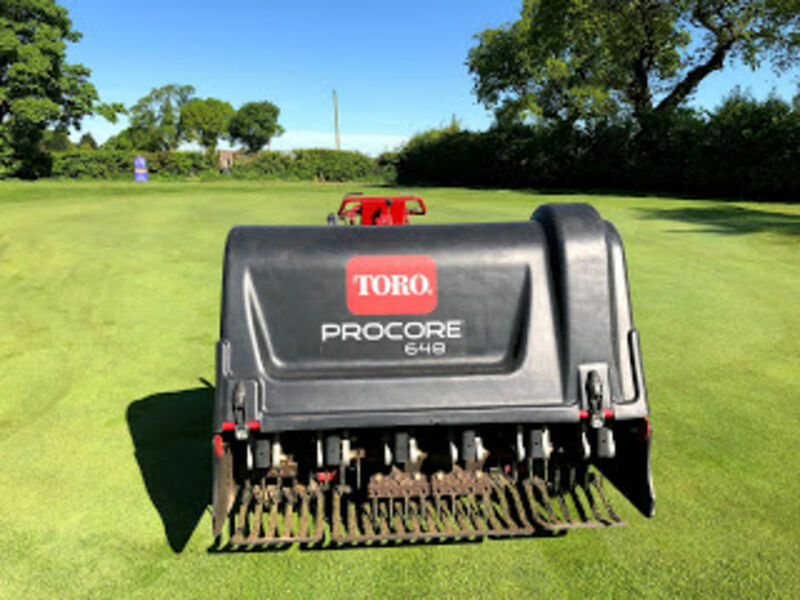 Tillers were used in the bunkers to loosen up the sand after the heavy down pours.We used the procore on the greens to aid water movement and air progression in the soil structure. 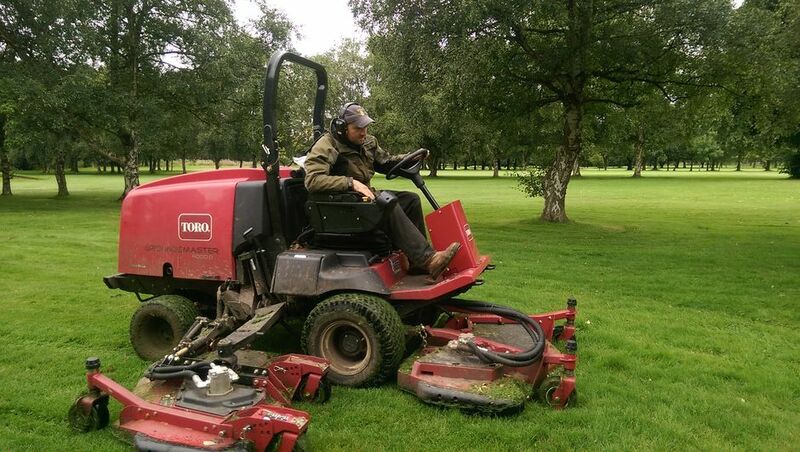 We had our yearly visit from the STRI with their Agronomist Mr Alistair Beggs reviewing the condition of the course. 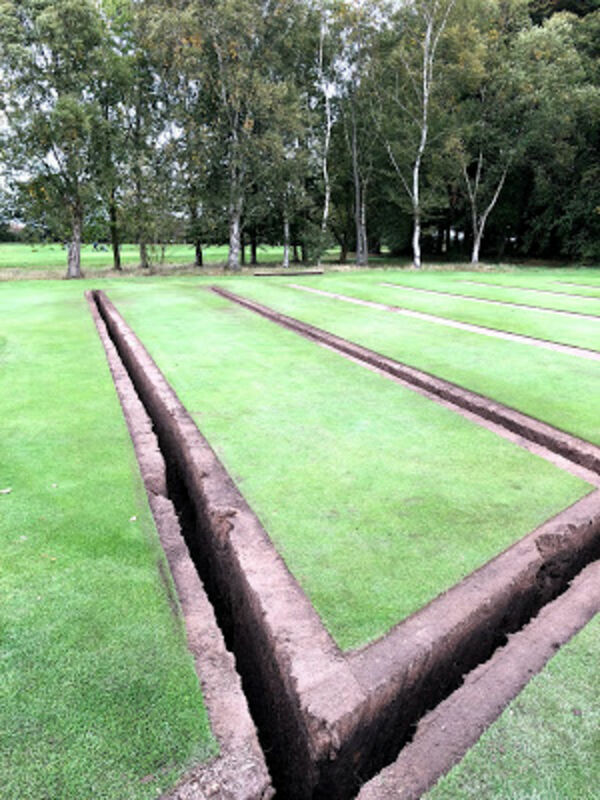 Alistair first visited Haydock Park in May 1999 and we are so fortunate to have one of the country's leading Agronomists to visit us yearly The report was very positive with most aspects of the course conditioning being in place, however in these challenging climatic times we need to advance our regular aeration programme to control the organic matter levels in the soil profiles. The full report is available in the clubhouse. 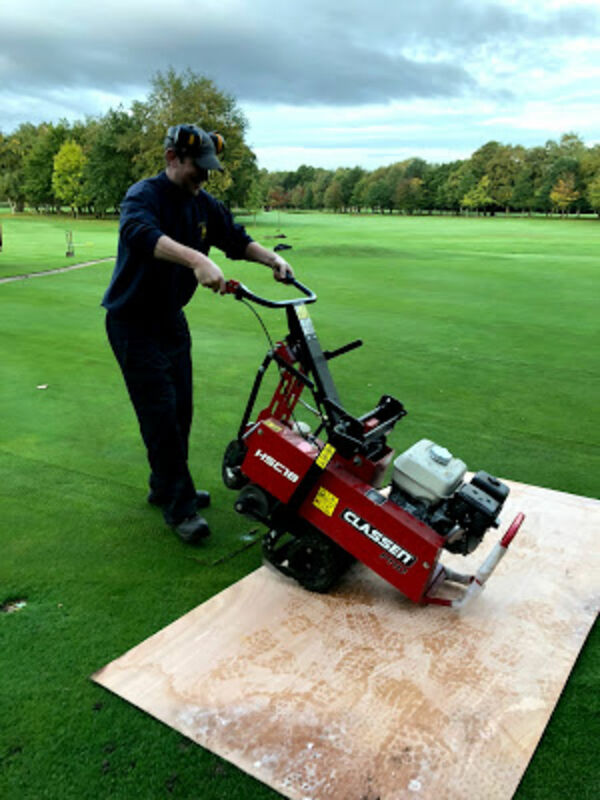 The picture below showing Alistair taking smoothness and trueness readings on the 18th green. 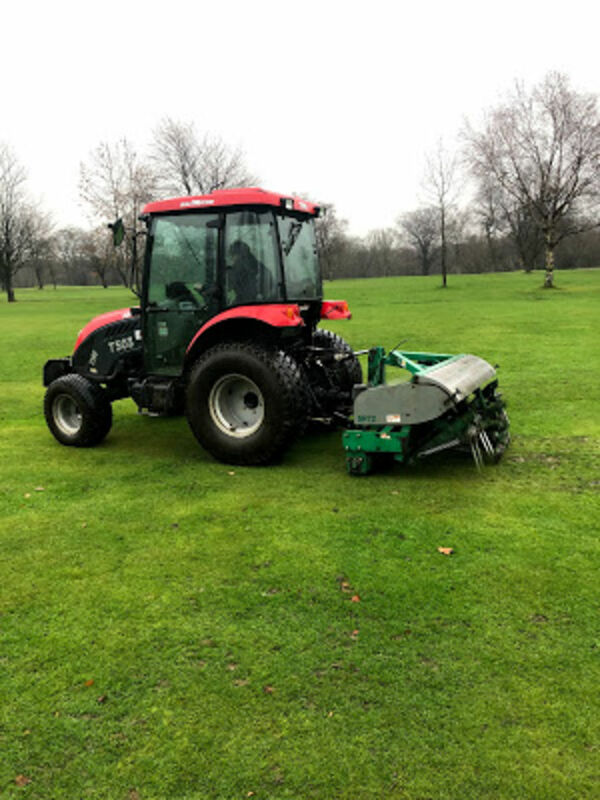 We hope to overseed the greens, strim the mounds and start picking up areas with the soil reliever,and start putting together various projects for the winter programme!!!! We seen a mixed period of weather in july with more periods of rain compared to June, these conditions really got the grass growing. 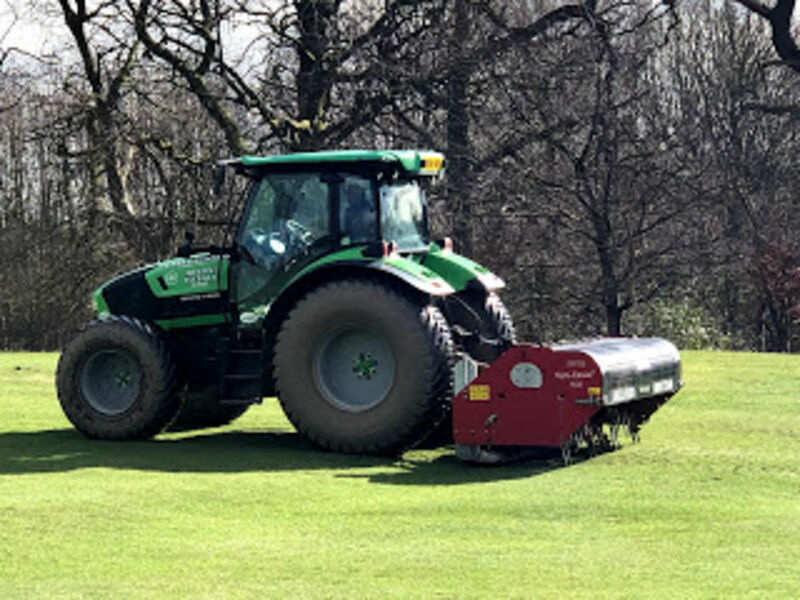 Aeration on the greens continued, the weather allowed us to spray a selective weed control on the tee and bunker banks, we followed up with a total weed control on paths and around the clubhouse. 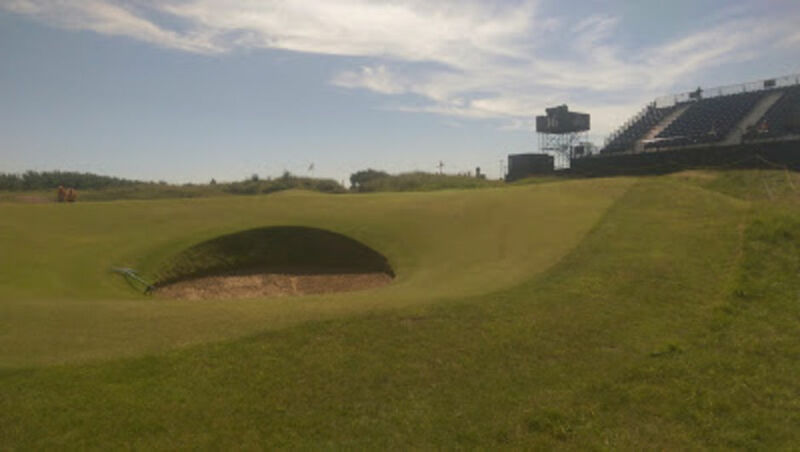 I travelled over to Royal Birkdale to have a look at the course set up for the Open Championship, the course was stunning with fabulous surfaces and great definition. Excellent work by their greens team. 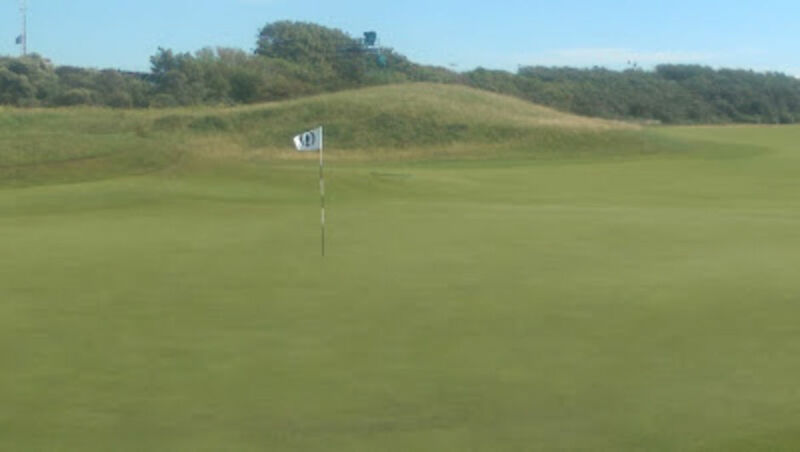 The Pictures below show some of the surfaces at Royal Birkdale. 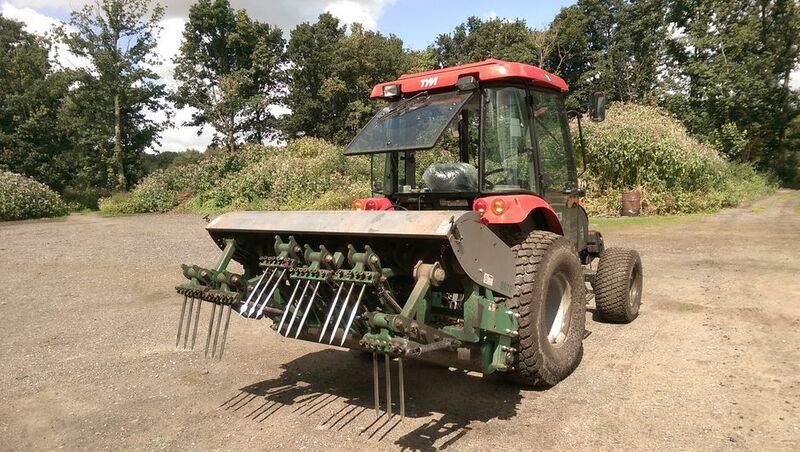 We hope to carry out deep aeration to the greens and spray a selective weed control to areas on some of the fairways. General cutting and course presentation will keep us busy. We had some glorious weather in parts throughout june. We applied a little irrigation on some areas on the greens to stop them from stressing out. 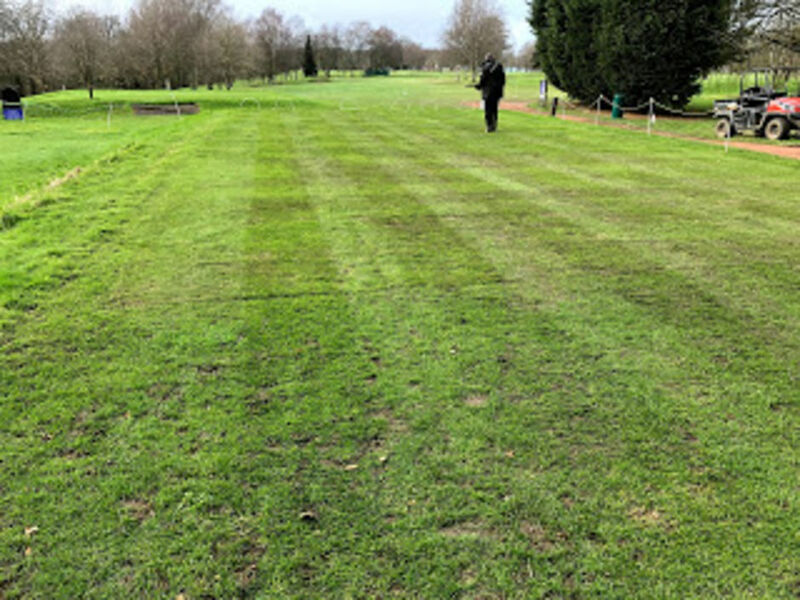 Most other areas of the course took the dry spell well with minimal drying out,showing the benifits of regular aeration developing good root structures. 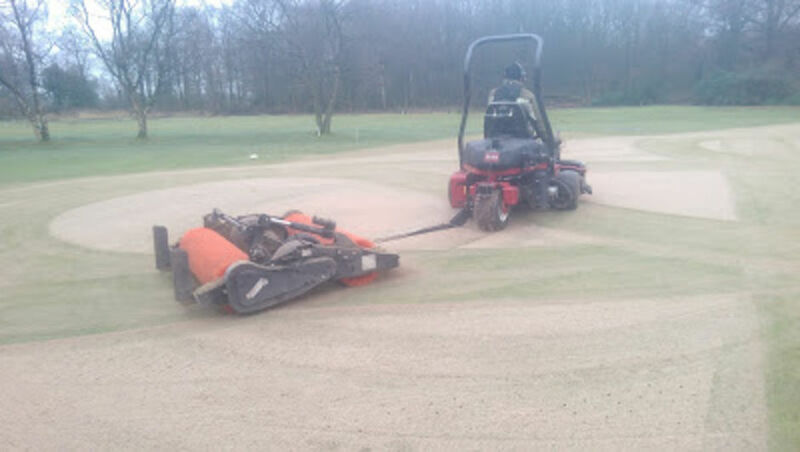 Aeration on the greens continued with the procore,and we topped up bunkers with sand. 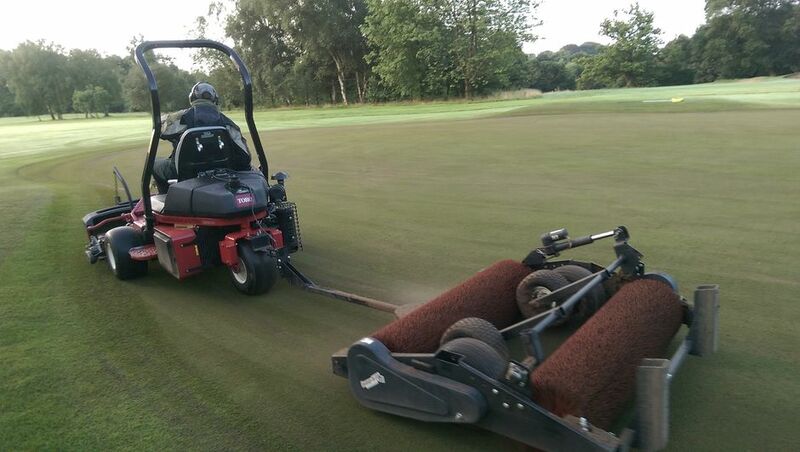 Regular grooming and rolling has been carried out to aid smooth ball roll on the greens. 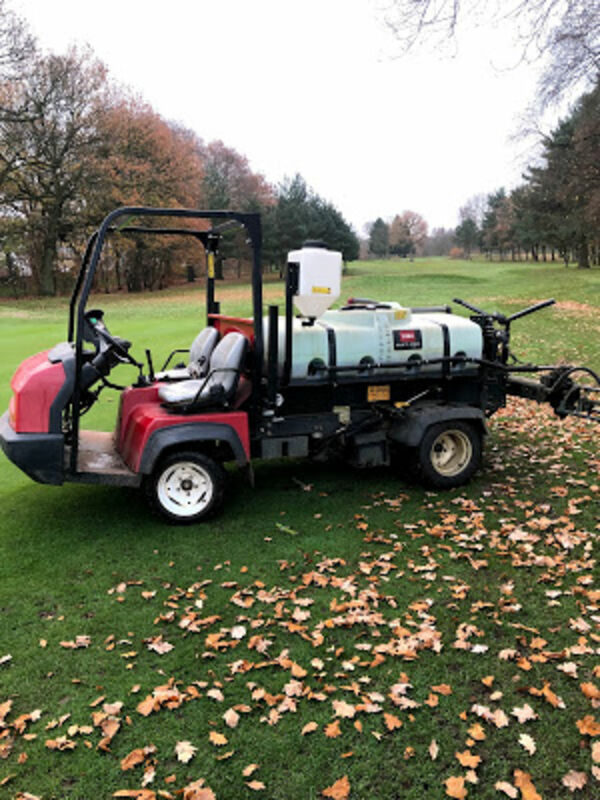 We applied our monthly spray of conditioner and wetting agent on the greens to keep the plant healthy and to help to control moisture levels in the soil structure. Below are some of the various works completed throughout the month. Welcome to our May blog. The soil temperature increased and towards the latter part of the month we had some rainfall. This started to get things moving on the course. 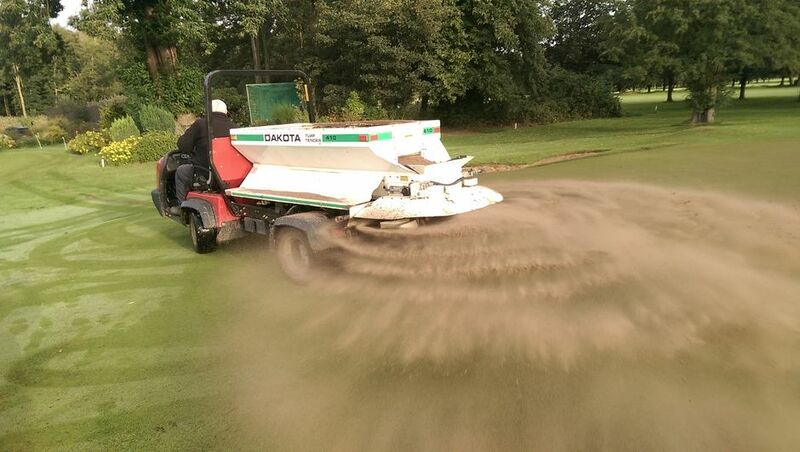 We have applied one hundred tonnes of top dressing to the greens since March, leaving us twenty tonnes to deliver between August/September when we overseed. 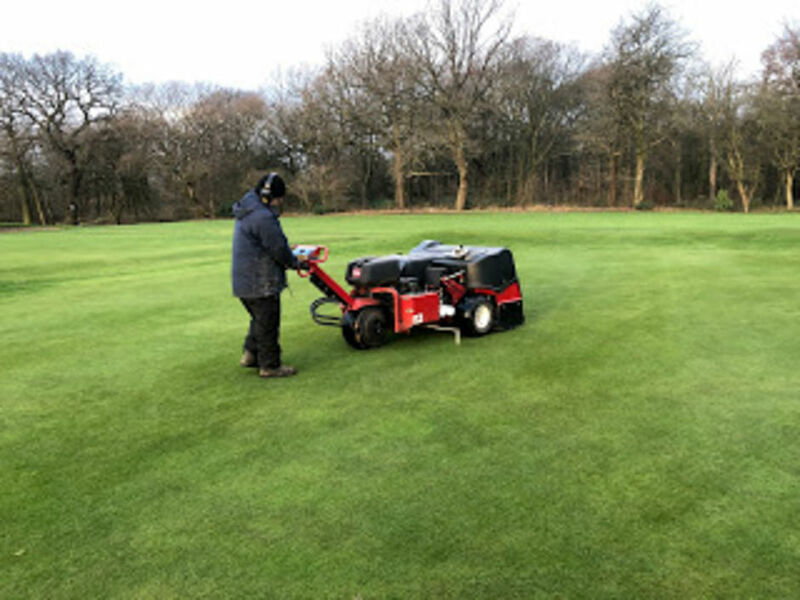 We've continued with our fortnightly aeration programme with the procore followed up with the monthly application of wetting agent and soil conditioner on the greens. 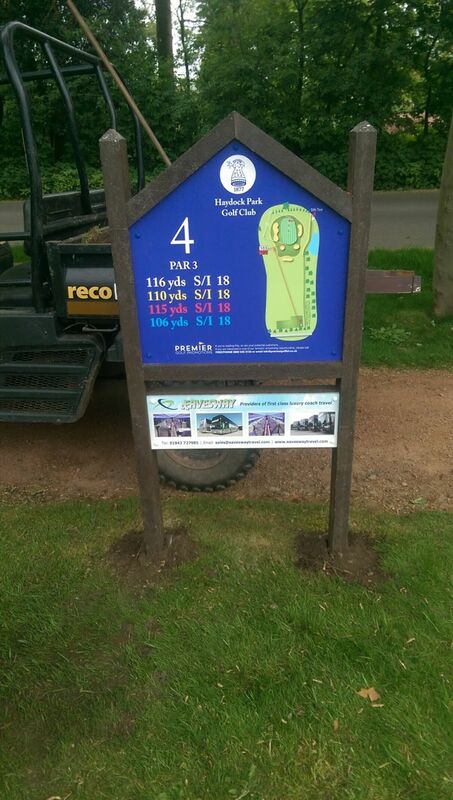 We positioned new tee signs on each hole which look really good. Below are some photographs showing the various works. 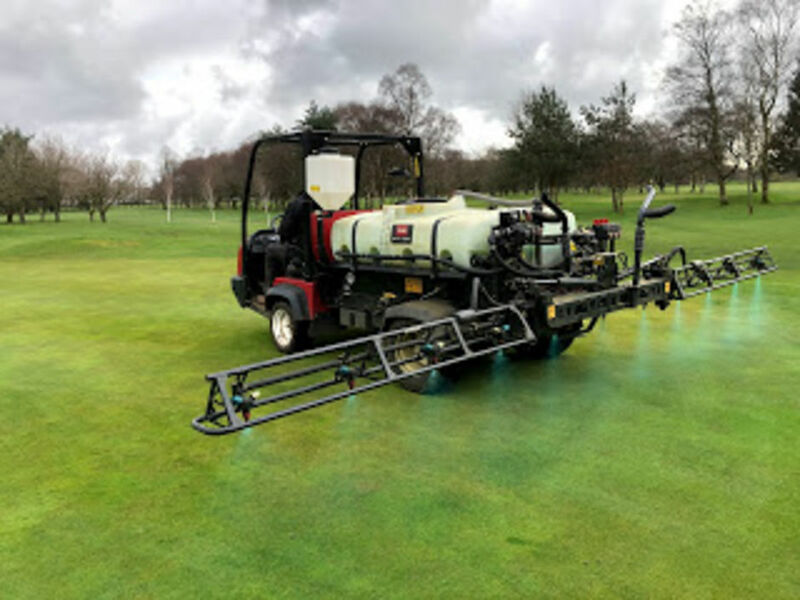 Mallinsons came in to vertidrain the fairways,We applied a touch of water to the greens to wash the top dressing in.The sprayer was used applying conditioner and wetting agent to the greens which was also washed in. Below are some pictures of our progress throughout the month. 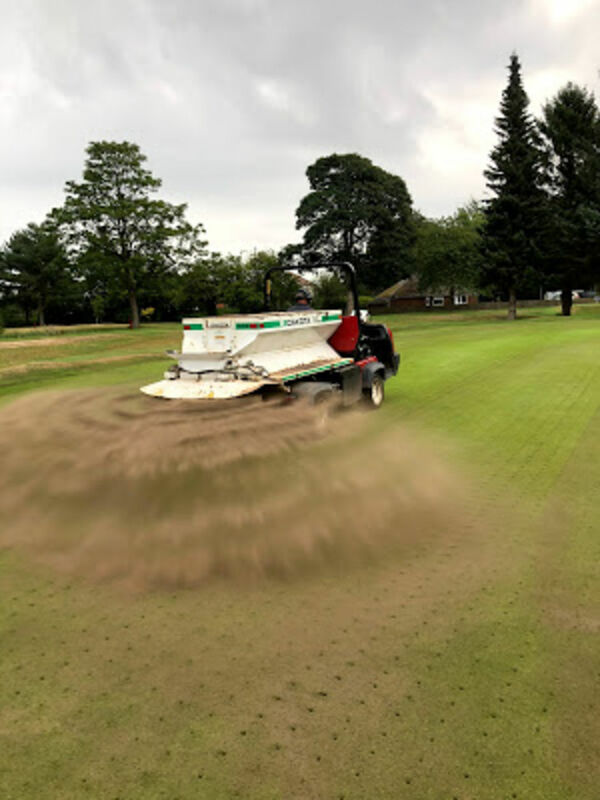 We hope to see a rise in temperature to aid growth, our top dressing applications will continue alongside aeration.Bunkers will be topped up with sand and cutting on all areas will increase. The early part of the month was very wet but we saw a change towards the latter part with a period of dry weather. 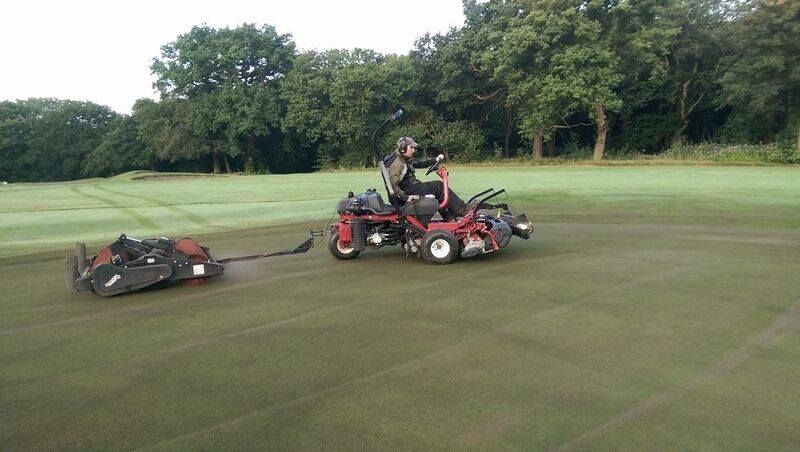 The cutting programme around the course was increased and the top dressing on the greens moved in to action. The increase in temperature enabled us to feed the greens and tees. We aerated the greens with the procore and loosened the bunkers with the tiller. 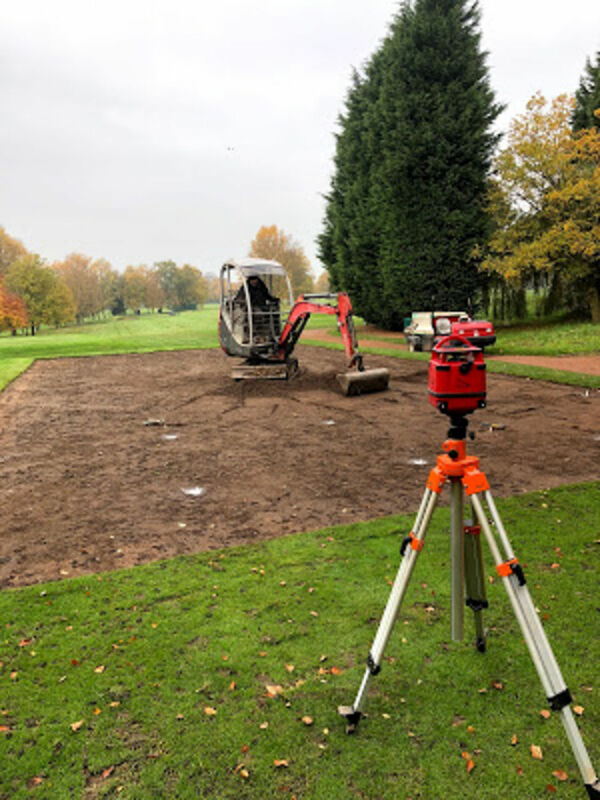 The greens team worked on a landscape project which prepared an area near the club house to be used for photographs for weddings etc. 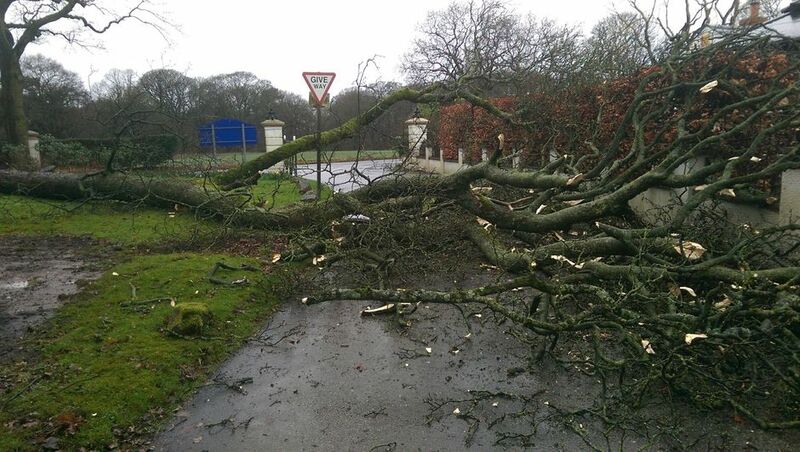 As usual the weather controlled the work programme with periods of rain and a visit from storm Doris that created additional work with the chainsaws. 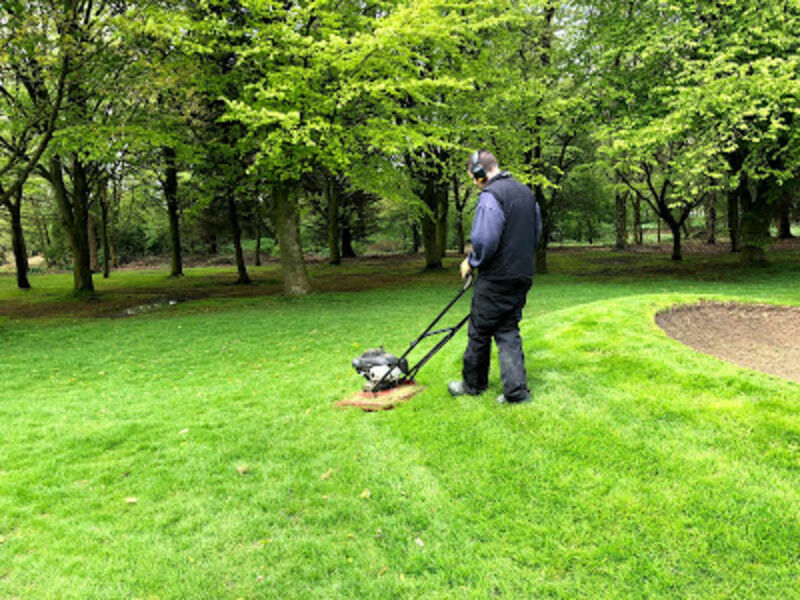 We carried out deep aeration to the green, tees and walkways.The occasional dry spell allowed us to pick up a little cutting on various areas. The pictures below shows some of the work throughout the month. 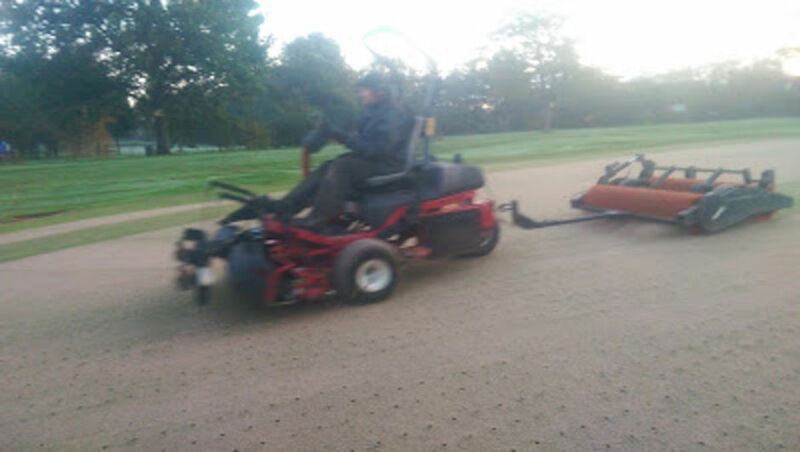 We hope to start our top dressing on the greens,and our regular aeration work. We will be starting to shape and cut areas ready for spring. The weather throughout the month allowed us to complete our work programme. We had periods of frost, wind, and rain with the course being heavy at times. 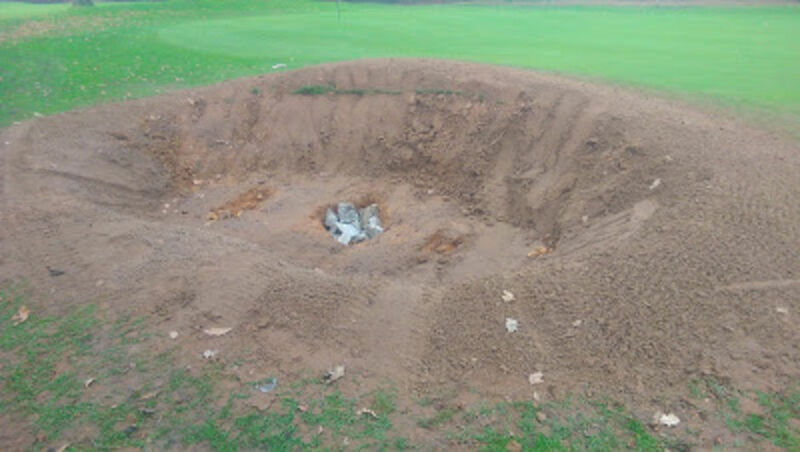 We used the mini digger to put in gravel bands at the right hand side of the 6th green to help to drain the area. 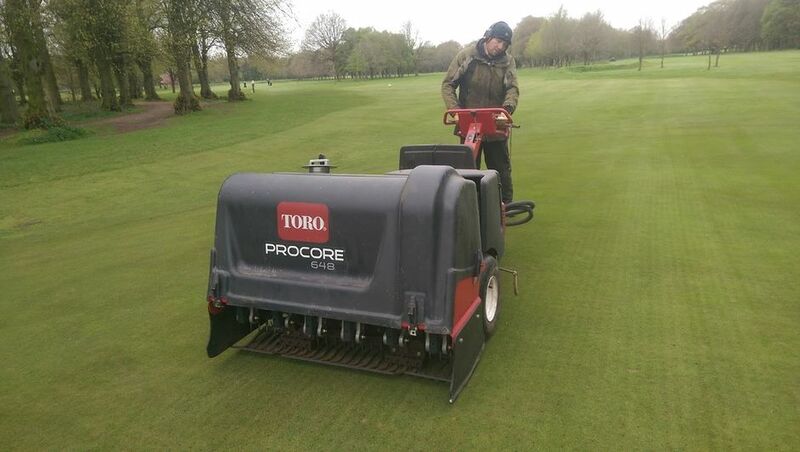 Aeration continued on the greens with the procore, followed up with a cut to tidy up the surfaces. The fairways also received a trim to give better definition and shape. 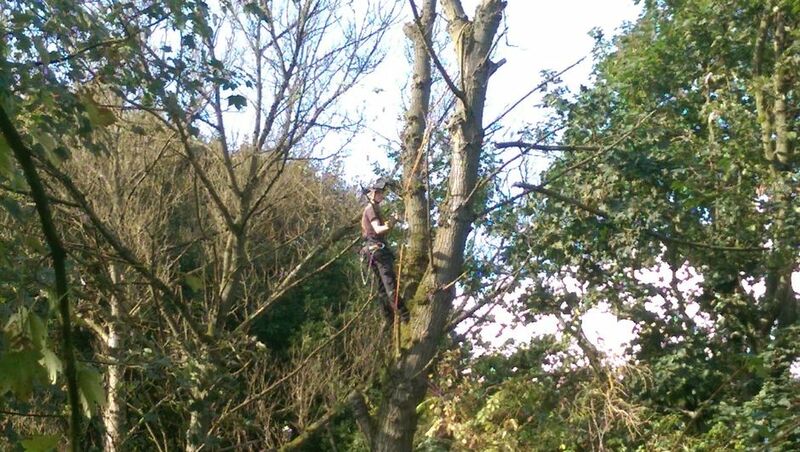 We used the pole saw to remove the lower branches off the trees, the trees look so much better giving them great shape and definition. The pictures below show the various work throughout the month. 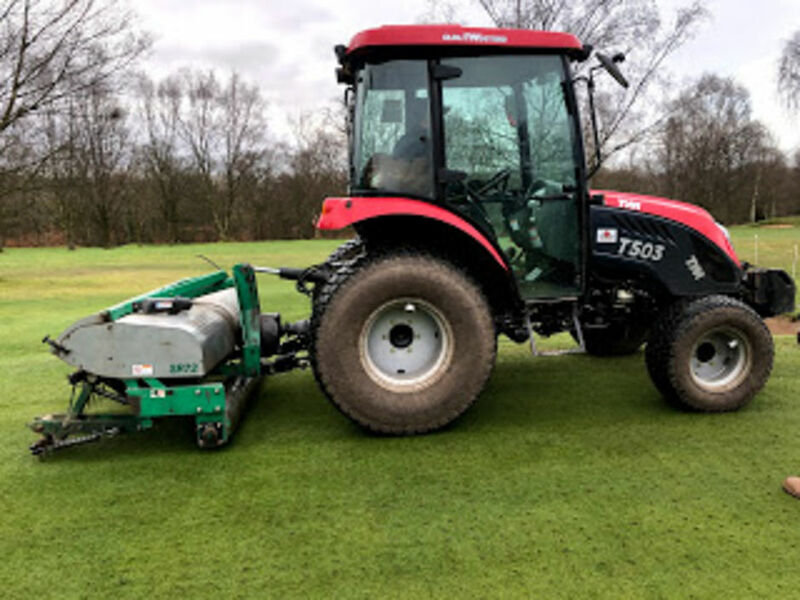 We hope to use the soil reliever on the greens and tees and start top dressing the greens.We aim to turf drainage lines and start topping up bunkers, and edging paths. The start of the busy period is getting closer!!!! Welcome to the December blog. 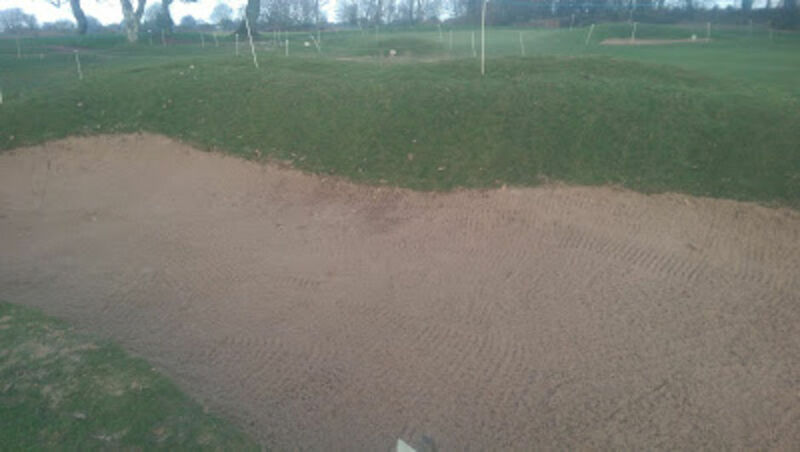 Our winter work programme continues with most of the bunker work being completed. 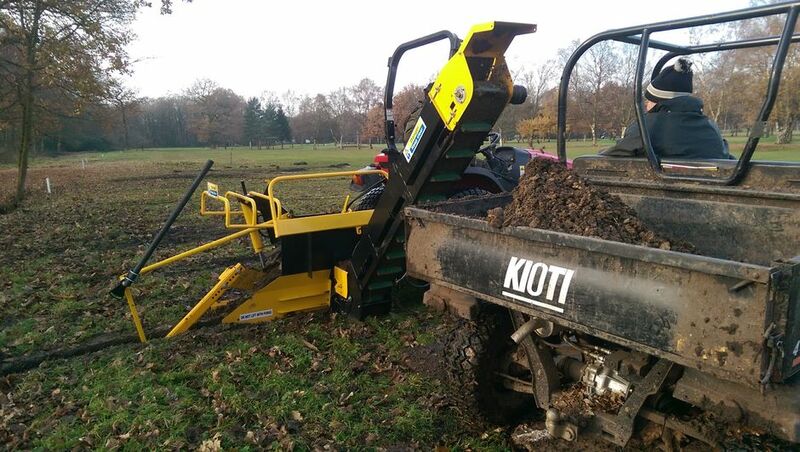 We've recently purchased a AFT 45 trencher to be used on draining problem areas. 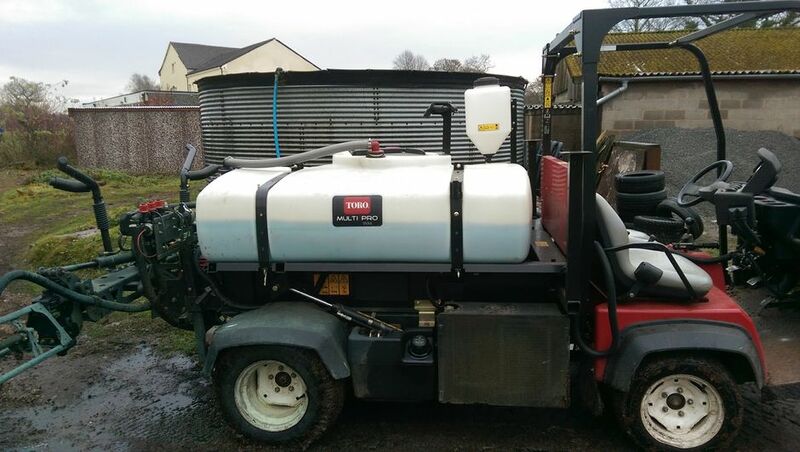 It is a great piece of kit that will allow us to tap into existing drains around the course. The weather throughout December was quite mild and damp with the occasional frosty spell. These conditions are ideal for the development of turf disease. 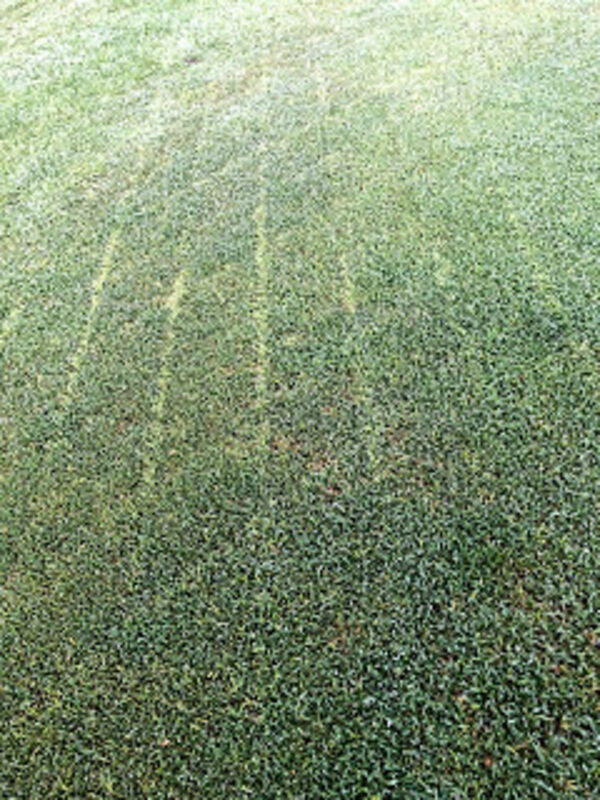 The most common disease at this time of the year is Fusarium Patch caused by Microdochium nivale. This Fungus attacks the grass plant and kills affected areas. 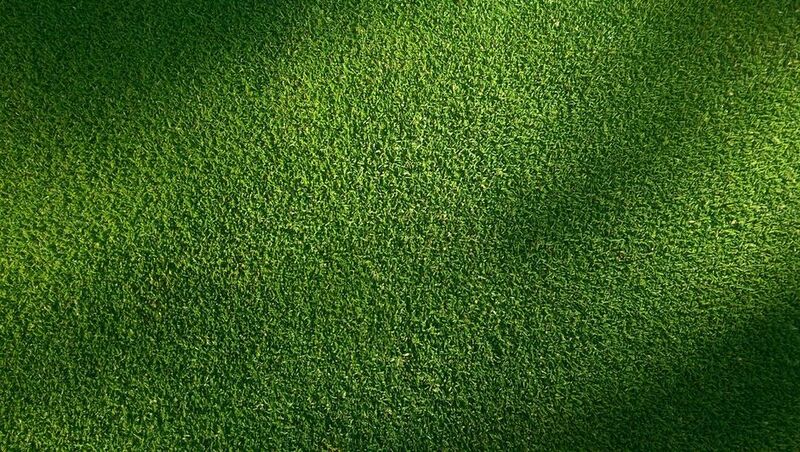 It is most noticable on the greens, but can attack all the other grass areas on the course. 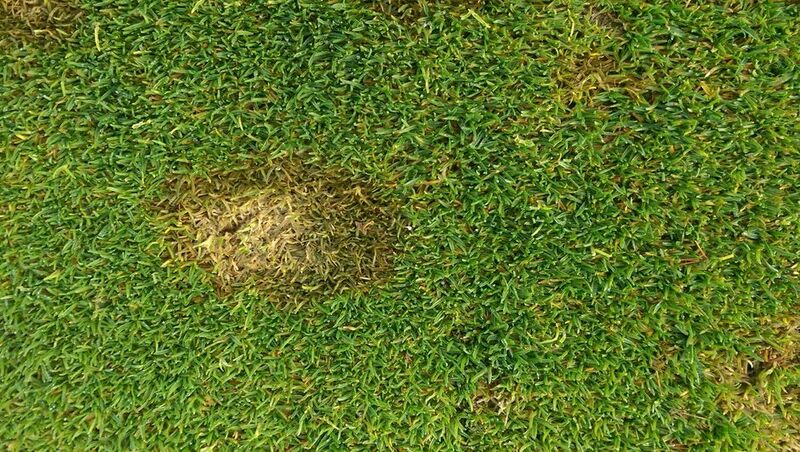 The mild damp, humid, conditions in December have been ideal for the disease to attack the turf. To prevent the attack we apply a prevetative fungicide,but if the disease pressure is stronger than the chemical then an attack can take place. Photographs below showing some of the points that's been discussed. 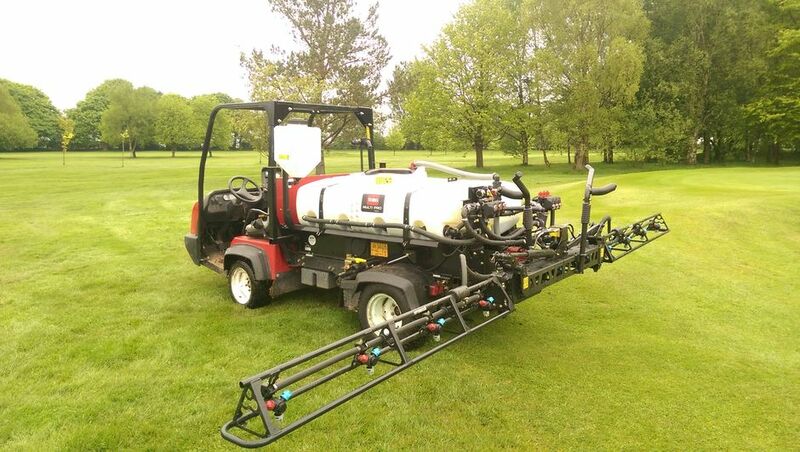 Sprayer ready to apply a preventative Fungicide. 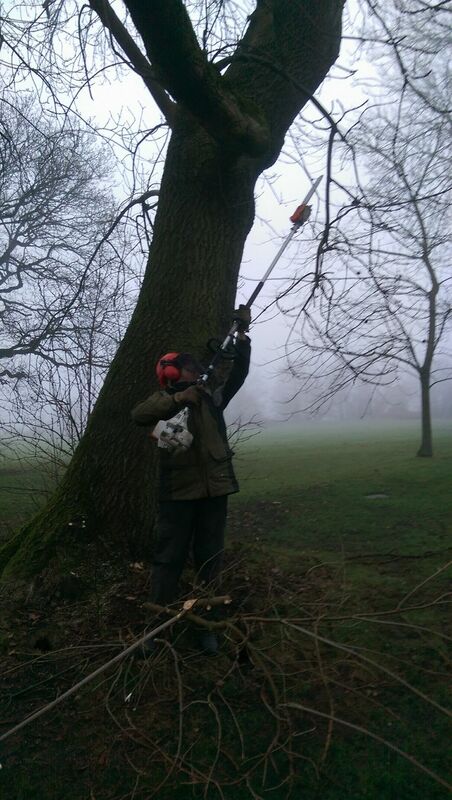 In January we hope to continue with drainage work and start on cutting back low branches from around the trees. Welcome to our November blog. The weather allowed us to make a great start to our winter programme. 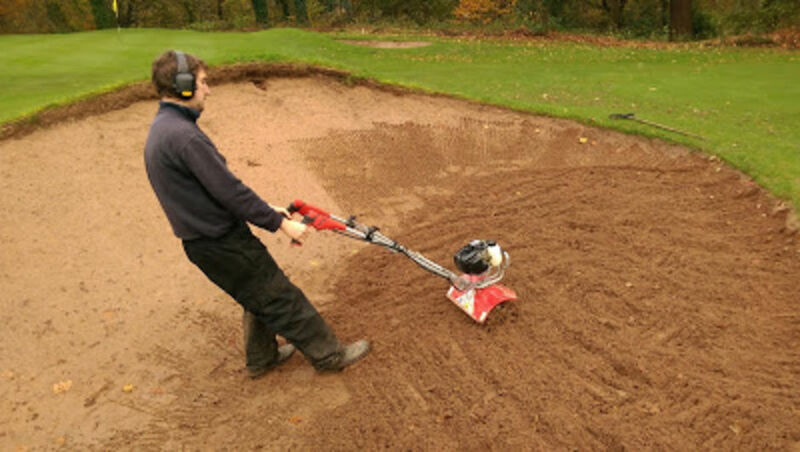 We looked at shaping, draining and taking off the overhanging lips on selected bunkers. 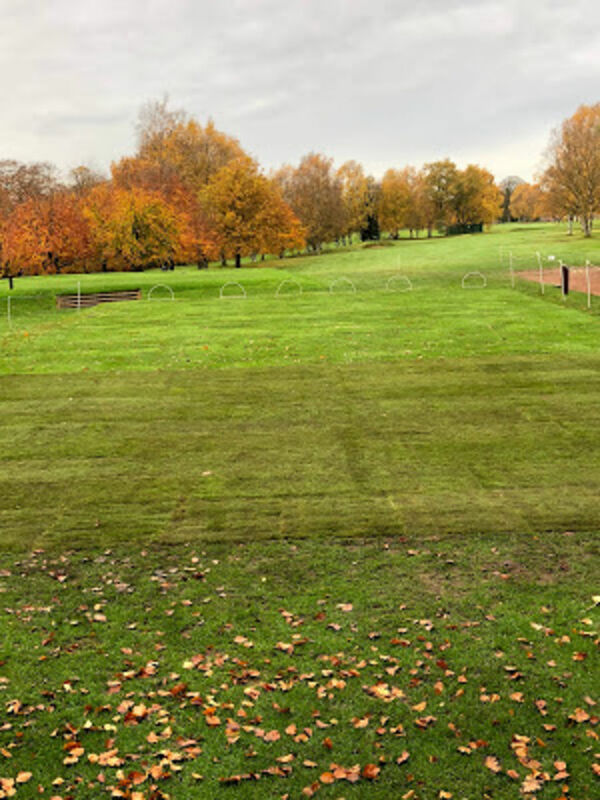 Work was completed on taking out the small mounds on the 5th hole, the mound on the 1st hole and filling and turfing the small bunker on the 11th hole, The temporary tee on the 12th was taken out because it is no longer used and this area will be prepared ready for seeding. Removing the leaves continued with no help from the wind, the majority just dropped and were removed off the course with the tractor mounted blower. We continued our aeration on the greens and tees. The fairways were cut to give definition. The greens were sprayed with a preventative fungicide to control Fusarium patch which is a fungus that attacks fine turf. 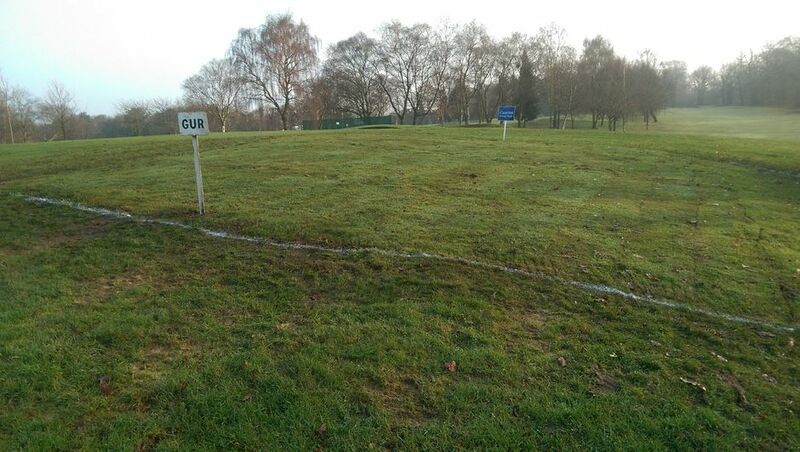 I will go into more detail in our December blog explaining the conditions that enable the disease to damage the turf. Below are a selection of photographs showing some of the work that's been carried out. Small mounds on the 5th hole. We hope to continue with our programme throughout December, and as usual the weather will decide what order it is carried out in. Welcome to the October blog. We've been busy on the various projects, the pictures below will show the works. Autumn leaves ready to fall. 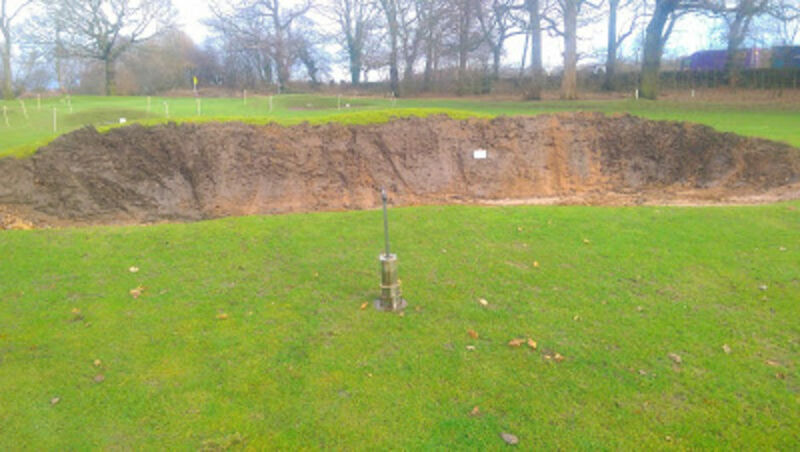 We will look to start bunker work throughout November with our aim to reduce the over hangs on the face and create a better shape to them. 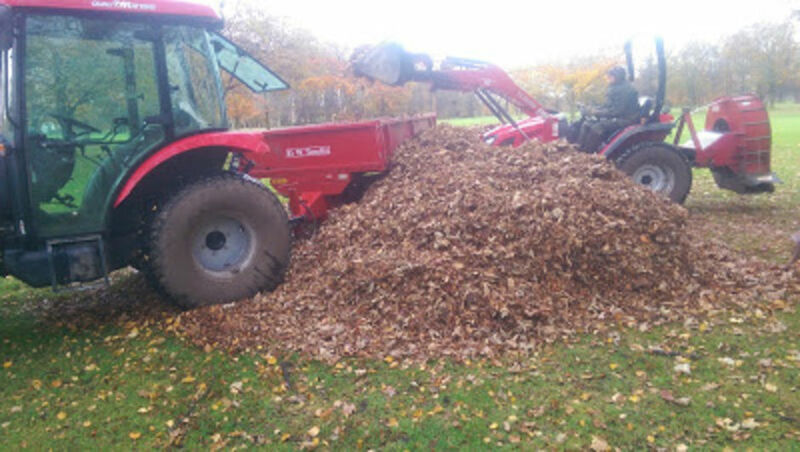 Leaf removal will increase as they start to fall. 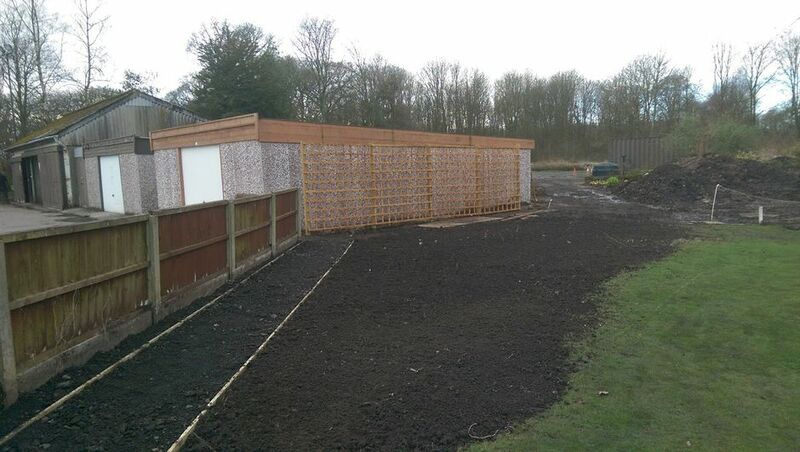 Lets hope for some dry periods throughout the month to allow us to complete the work. We managed to get good results with our overseeding on the greens. The weather was kind with good temperatures and sufficient rainfall to aid the germination. 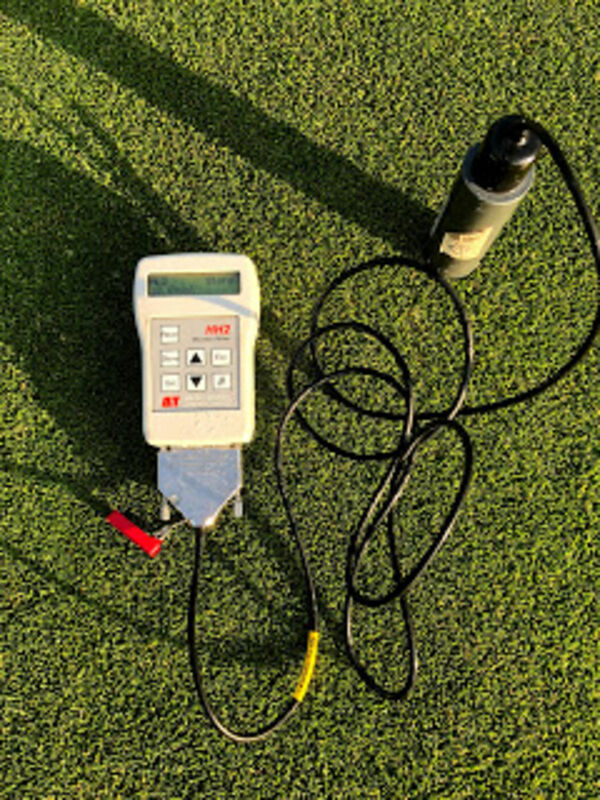 The pictures show the soil temperature when we sown the greens, the early germination and the machine we used. It is really important that we carry out this work when the soil conditions are beneficial to aid germination. 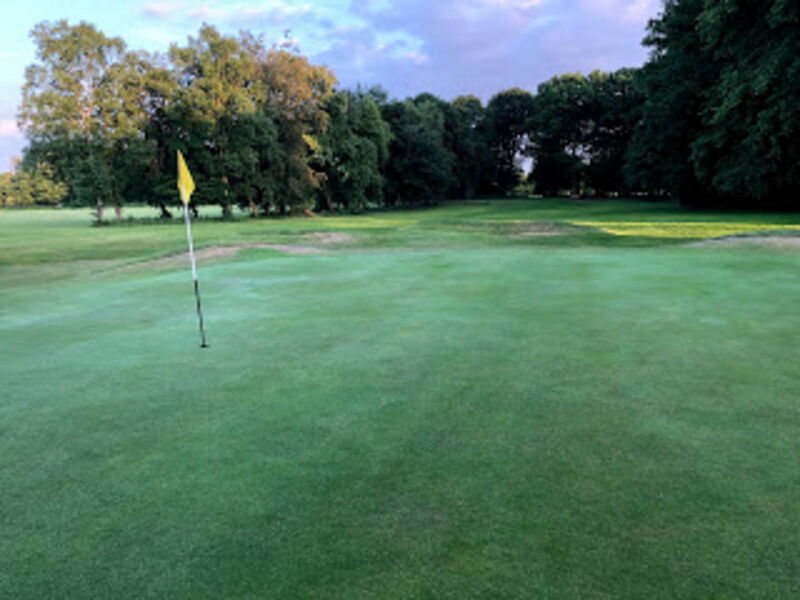 There is a slight reduction in greens smoothness for a short period of time, but the introduction of additional desirable grasses compensates for this and after a couple of roles with the turf iron the surfaces soon recover. 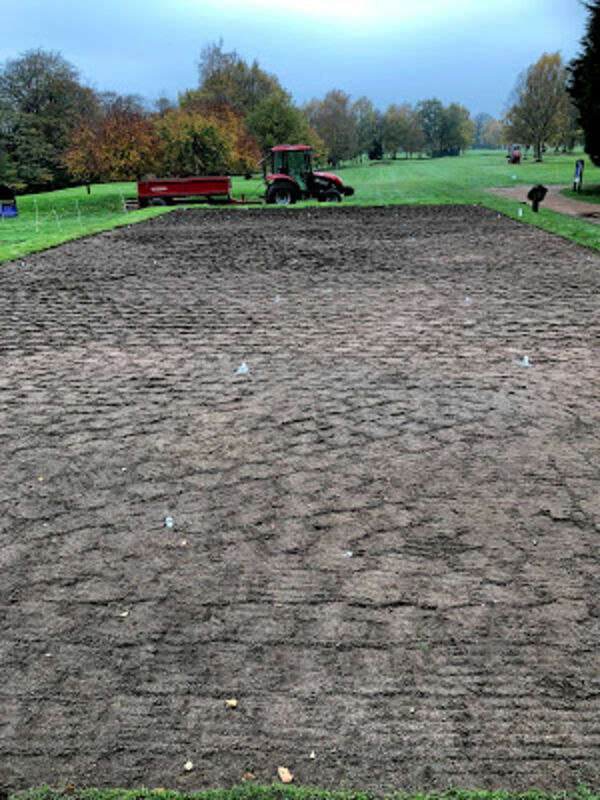 Obviously on the flip side if the work was left to later in the year there's a huge risk in loosing the soil temperatures and reducing the germinating seed. We continued with our aeration on the greens and followed up with a preventative fungicide spray to control Fusarium Patch. 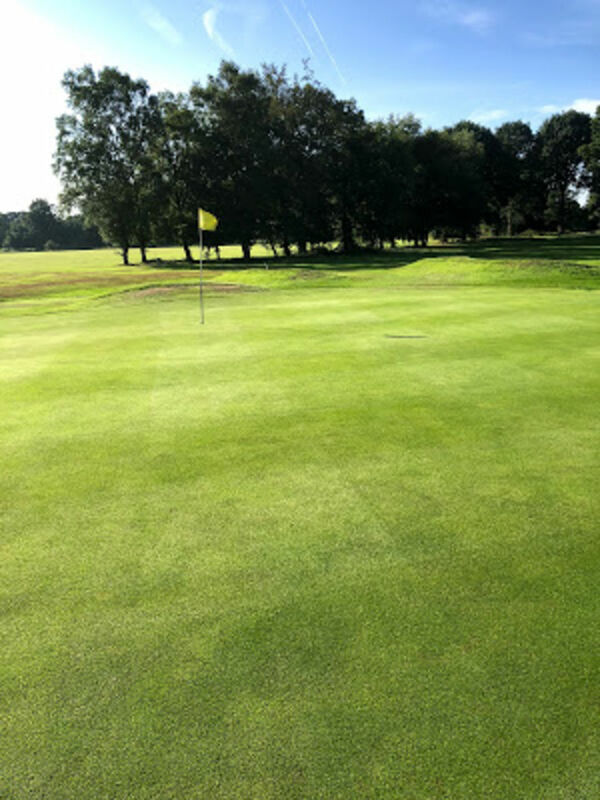 The present weather climate is really conducive to outbreaks of turf disease with the mild temperature and periods of heavy morning dews enabling the disease to attack the turf . 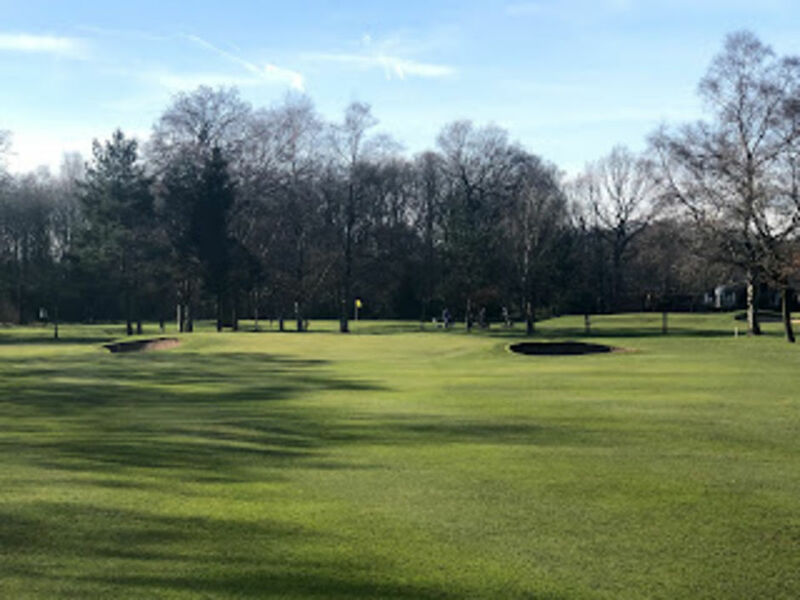 The damage can take place almost any were on the greens,however areas of shade and a reduction in air flow will create the ideal environment.This is one of the reasons we reduce tree numbers around the greens through selective pruning and removal to allow the correct conditions to be achieved to reduce disease outbreaks. 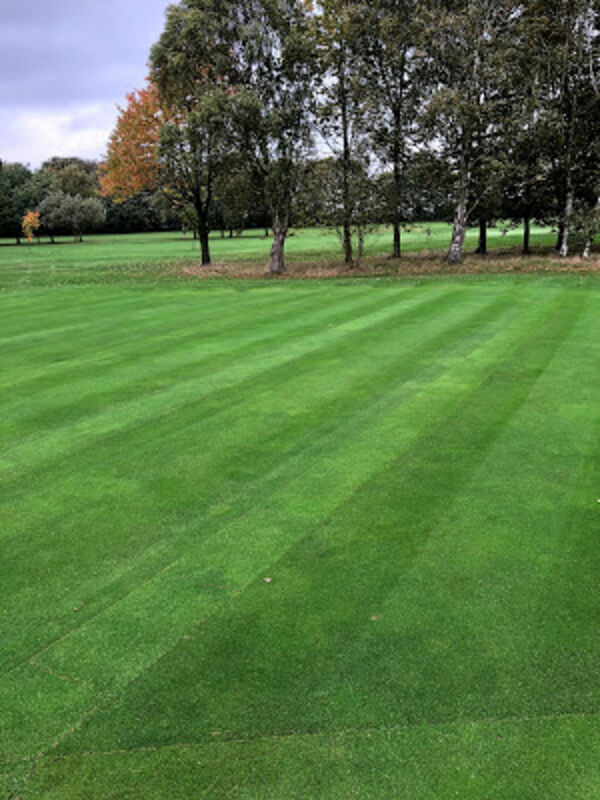 We will look to vertidrain tees and have our contractors Mallinsons in to Vertidrain the fairways.The mounds at the 13th/15th will be strimmed and the grass raked and removed.We hope to reposition the winter tee mat at the 12th and position a new mat at the 1st tee.Work will commence on the trees on the 11th hole with tree surgeons coming in to reduce the overhanging branches and take down two dead popular trees near the 11th tee. The leaves will be starting to fall which will keep us busy through to December. 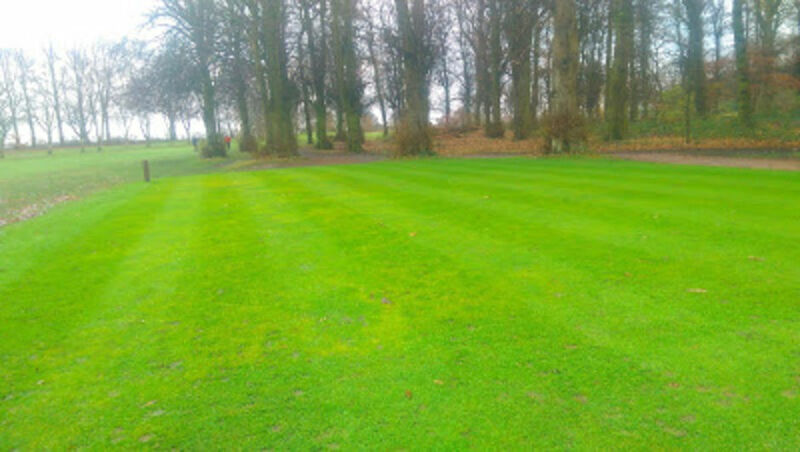 We've been very busy over the past few months with exceptional growth rates on the course. 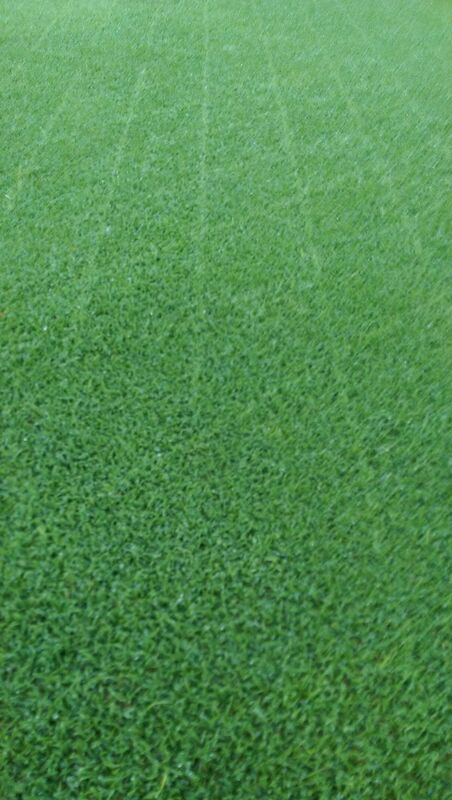 We managed to vertidrain top dress and overseed the greens the pictures below will show the programme of work. We will hope for good soil temperature and moisture levels to allow the seed to germinate. Sensible cutting heights will be managed throughout this period to enable the seed to establish. This work is really important in developing and renewing the grass composition on the greens. 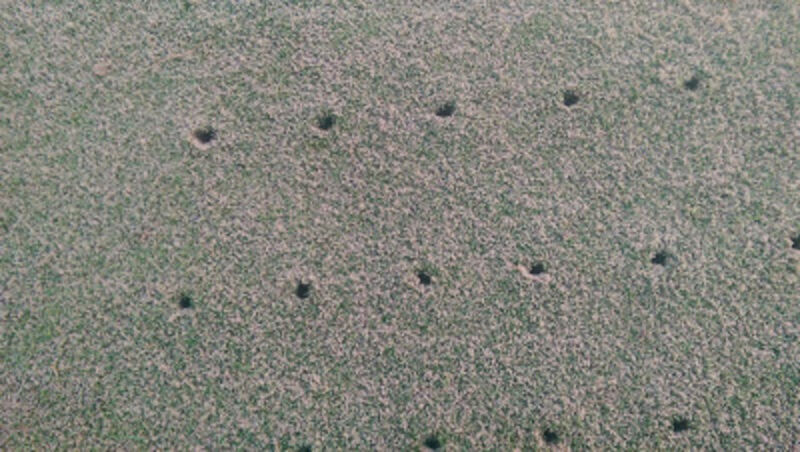 The timing of the work is so critical in achieving germination,and minimal surface disturbance that will quickly settle. 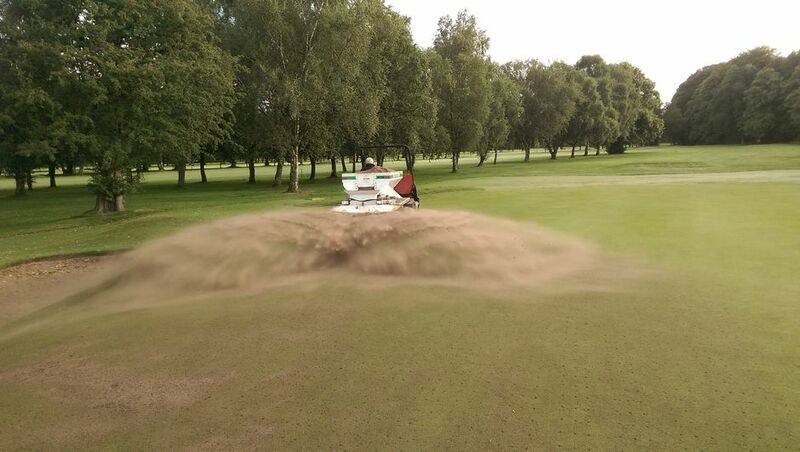 We hope to establish the seed on the greens and maintain healthy grass cover moving into autumn!!!!!!!! And keep on top of the excessive grass growth around the course. Sorry for the delay in getting the blogs out on time, only we've been flat out maintaining the course and managing the rough. The weather throughout July was changeable with periods of heavy rain followed by warm days this leading to heavy growth. the pictures below show our programme throughout the month. Spraying selective herbicide on tees and approaches. 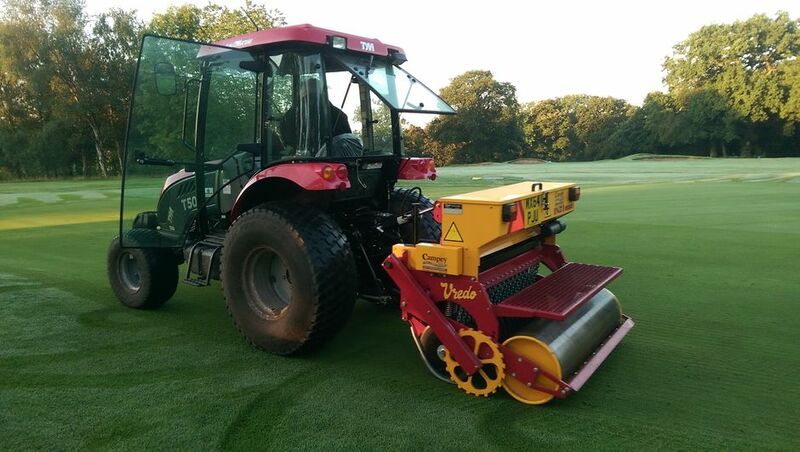 We hope to vertidrain top dress, and overseed the greens in August, alongside the general cutting, looks like its going to be a busy time. We finally seen a period of good weather in the early part of June, but the end of the month the rainfall figures were on the rise again. 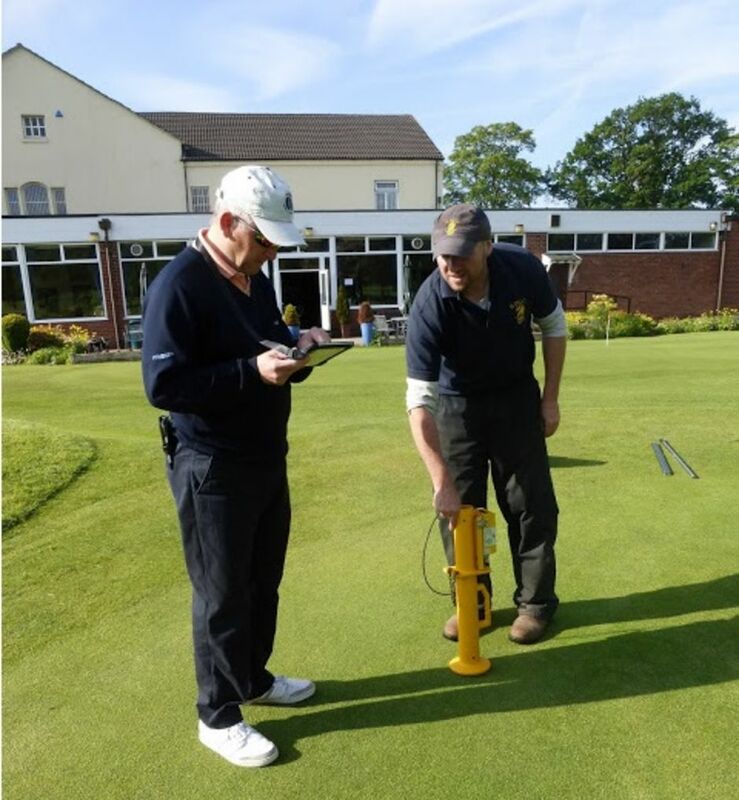 Mr Alistair Beggs from the Sports Turf Research Institute visited us to offer advice on our management practices and take various readings from our three indicator greens. He was very pleased with data he gathered from the visit and a copy of the report is available for members to read in the club house. 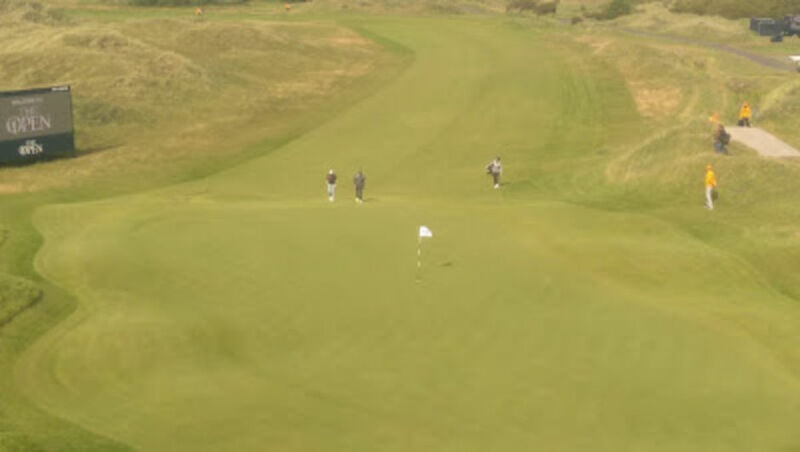 The pictures below show Alistair, and deputy Head Greenkeeper, David Traynor taking the readings on the 18th green. 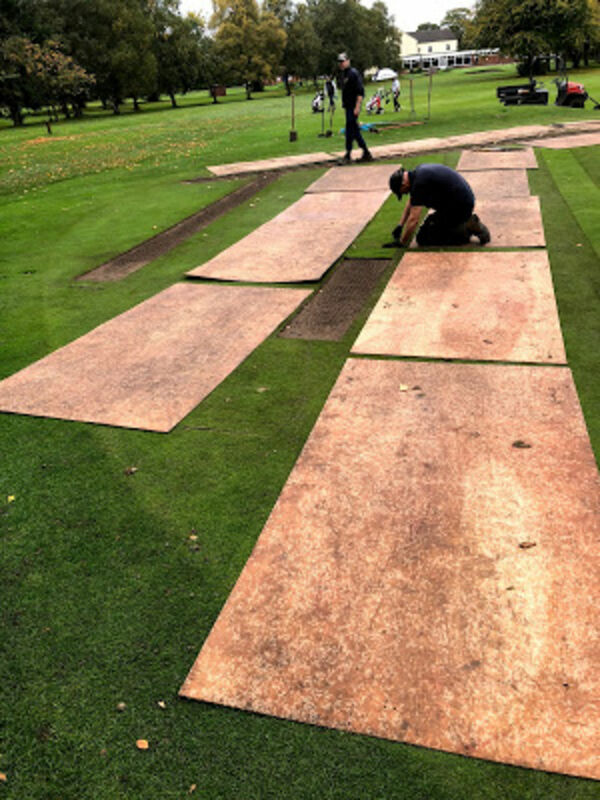 The seed on the chipping area as come through really well, we need to start cutting it to thicken it up and apply regular top dressings to aid its establishment. The heavy periods of rain left their mark on the paths. With this wash out being visible and ready for repair. We will continue with aeration,and applying various sprays to the greens. 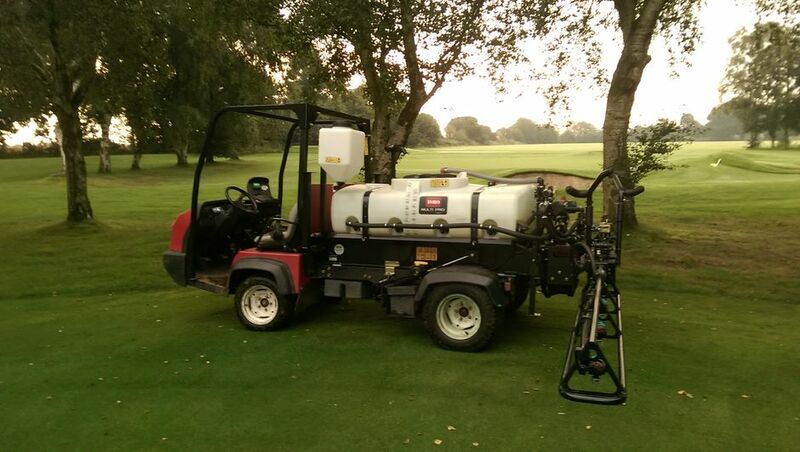 We hope to apply selective weed control to various areas on the tees and surrounds . Additional cutting will continue as the recent moisture and temperature levels have created ideal growing conditions. 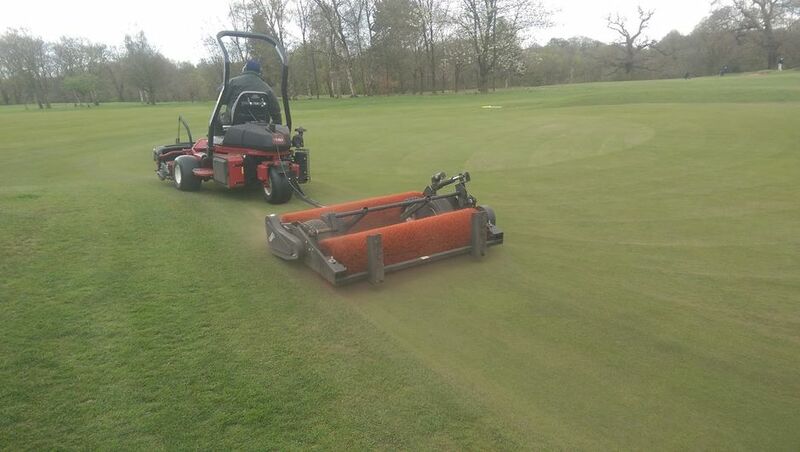 The greens team have been busy throughout May with an increase in growth. The rough around the the course has been especially lively, with the rise in temperature and regular showers creating a surge in growth. Aeration has continued on the greens and conditioner and wetting agents applied. Cutting height is set at 4.5mm. We've introduced our groomers into the work programme to clean up the base growth around the plant. 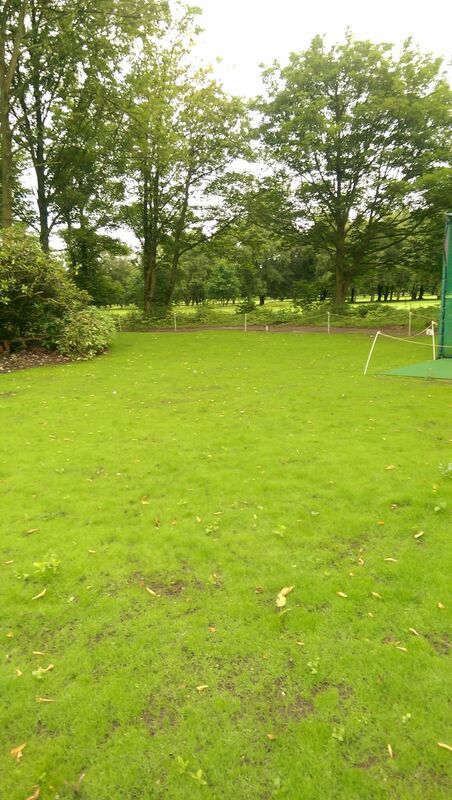 The area around the practice net has been landscaped and seeded to develop a chipping area. The timing of the work was great, with germination of the seed showing in ten days. In June we welcome our Agronomist Mr Alistair Beggs to review our management and project work around the course. Below are some photographs of our various works. 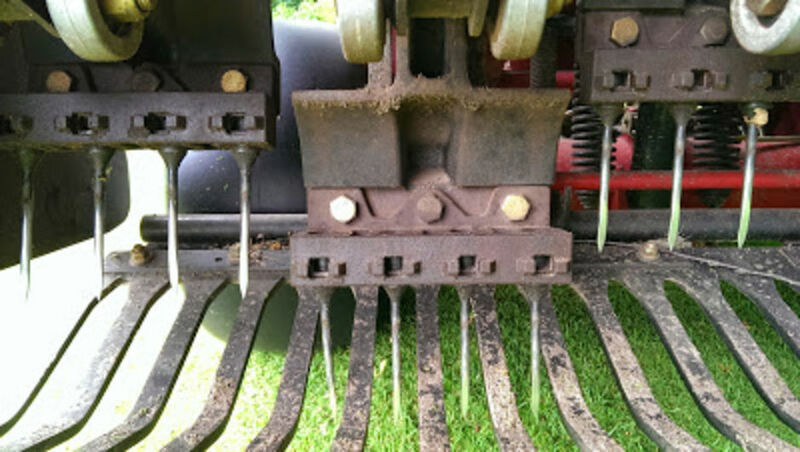 We will continue with aeration and grooming on the greens. 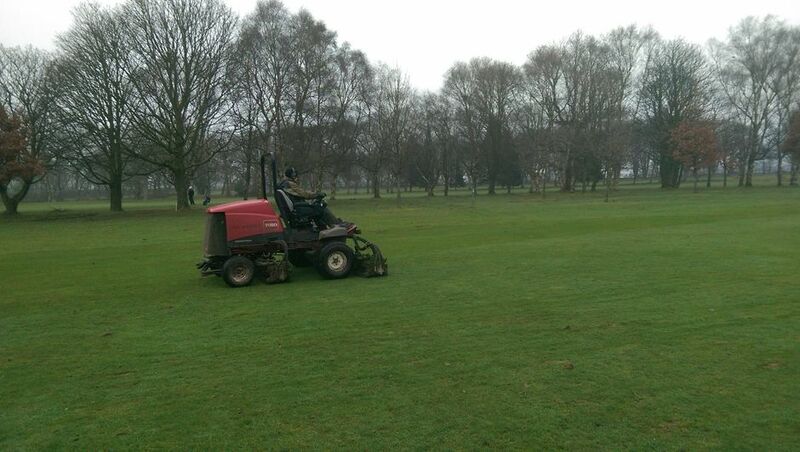 Cutting of the fairways and rough will be continuous if the weather stays mild and wet. The jobs list will get larger as we move into the busy time of the year. 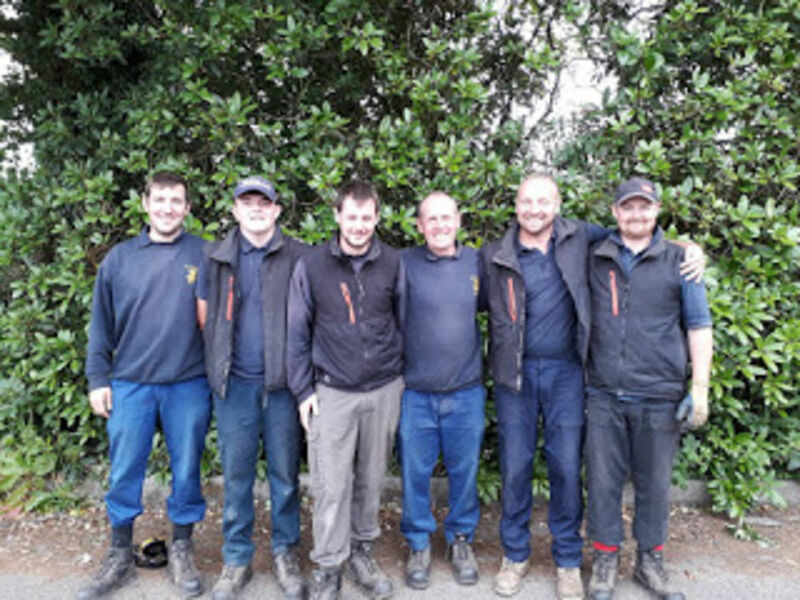 Welcome to our April blog, the weather continues to have a major influence on our work programme with the rainfall showing little change from the previous months. Throughout most of April we've had cold northerly winds with the temperatures 4-5 degrees lower than they should be for the time of the year. 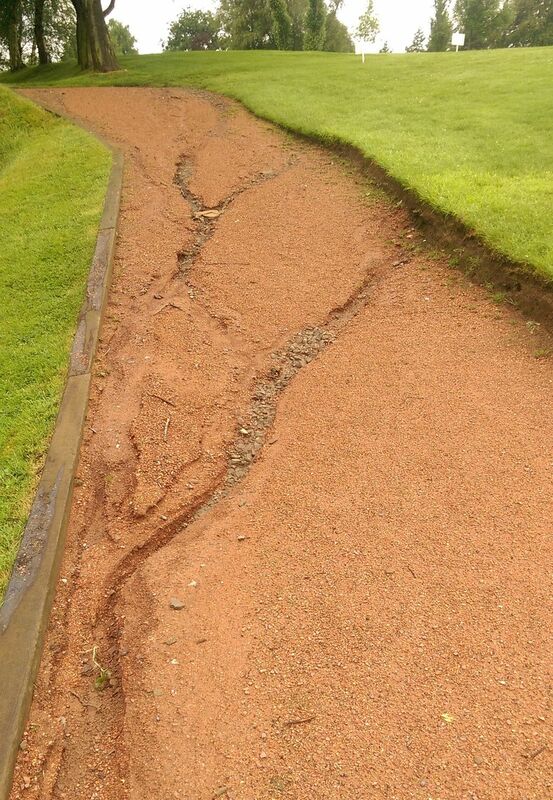 These conditions have significantly impacted in preparing the course for the start of the season. 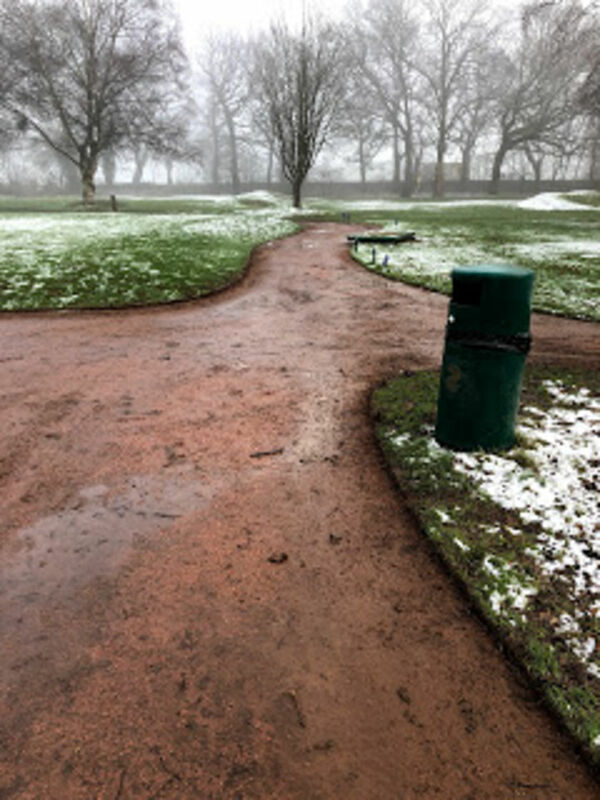 In spite of the weather the greens team with the help of a number of members have managed to complete most of the programmes planned for April. 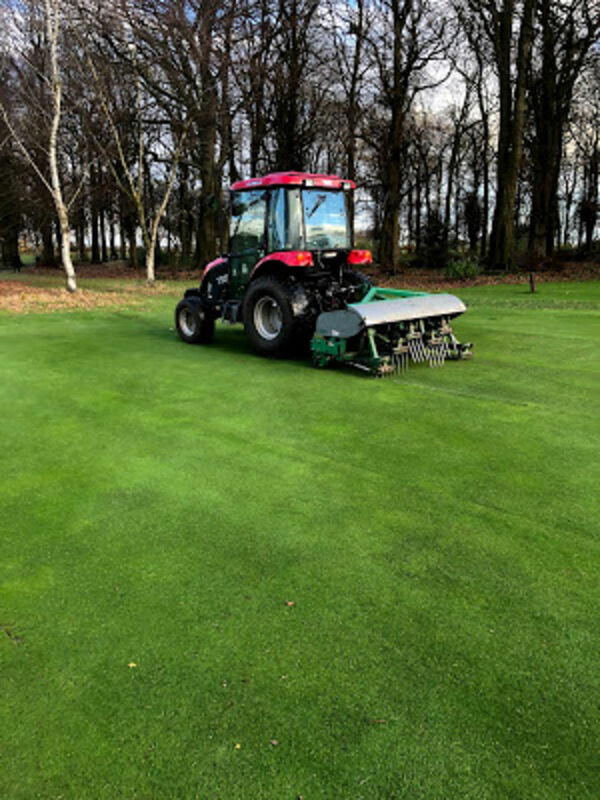 Mallinsons have vertidrained our fairways, top dressing on the greens has reached 60 tonnes, the greens have been procored,and a conditioner and wetting agent has been applied to them. 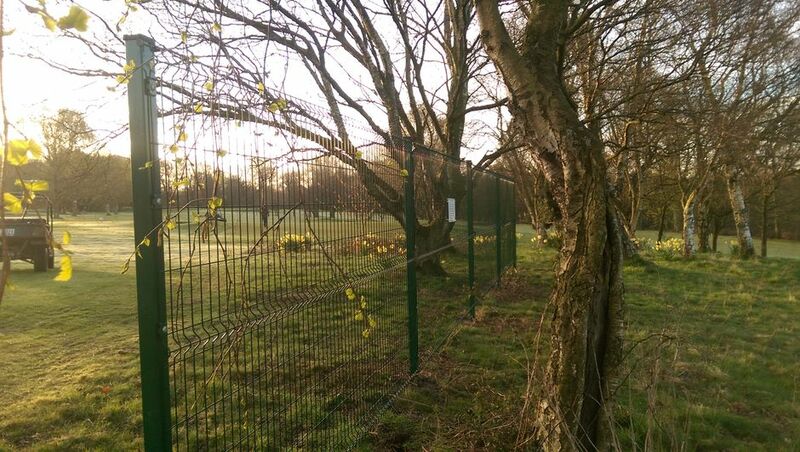 A new fence has been positioned at the 5th green. Below are pictures showing the various works. 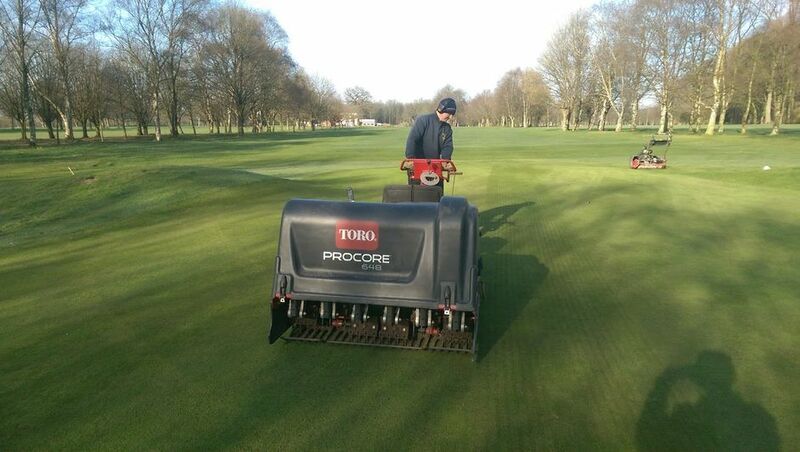 Lets hope for some glorious weather in May, we aim to feed the greens continue with the aeration and top dressing. 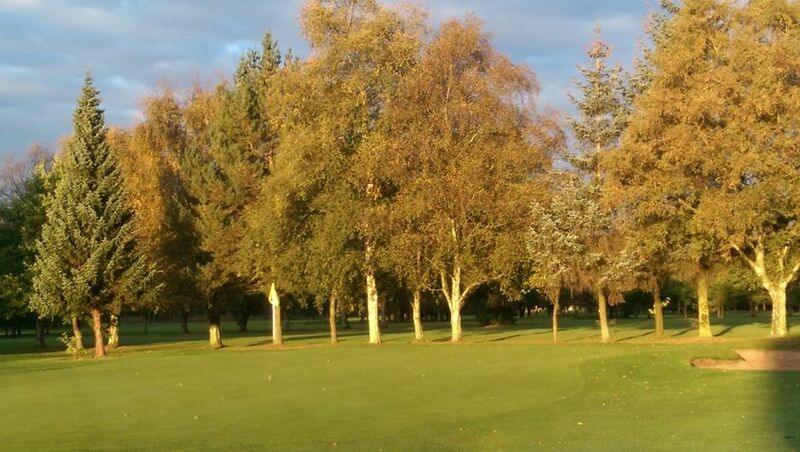 The leaves will start to dress the trees and with regular cutting the course will start to flourish. Welcome to our March blog. We had a great dry spell for the early part of the month that allowed the course to dry out significantly. It seemed that we were going into a period of prolonged dry weather which would allow us to get the course into good shape. However the the weather took a turn for the worse and the rainfall continued to fall. We had rainfall figures of 89mm in March. The greens team managed to complete most of the programmes that we had planned to do with pictures below showing them. 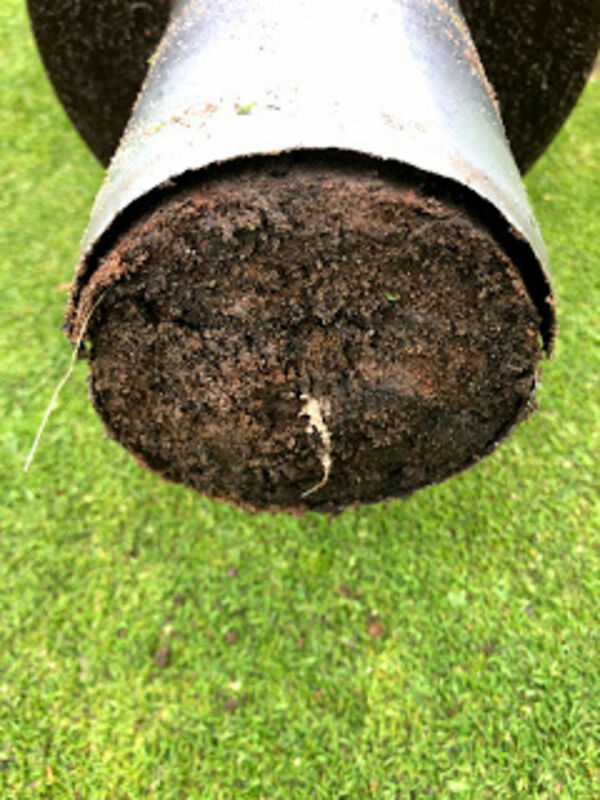 The deep aeration on the greens was vitally important after the prolonged rainfall.Breaking up any surface tension and allowing root development. We've followed up with regular top dressings and considering the wet conditions managed to apply 50 tonnes to the greens so far. 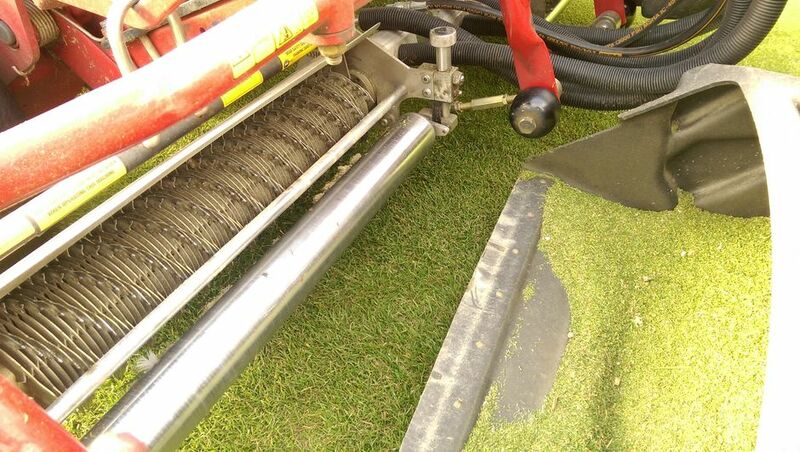 The dressing have been brushed in with the sweep and fill brush system, this piece of equipment is excellent. It really works the dressing into the canopy of the plant reducing particles on the surface. 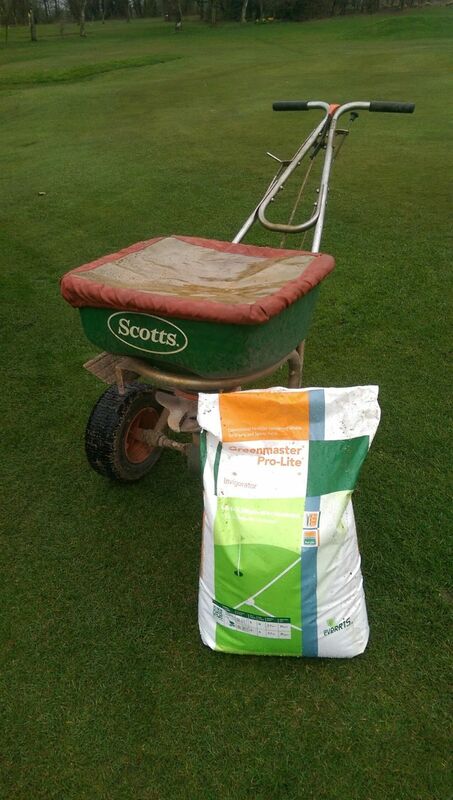 This work was followed up with a feed on the greens to stimulate growth after the winter play. The take up of the fertiliser was good giving us controlled growth and colour. 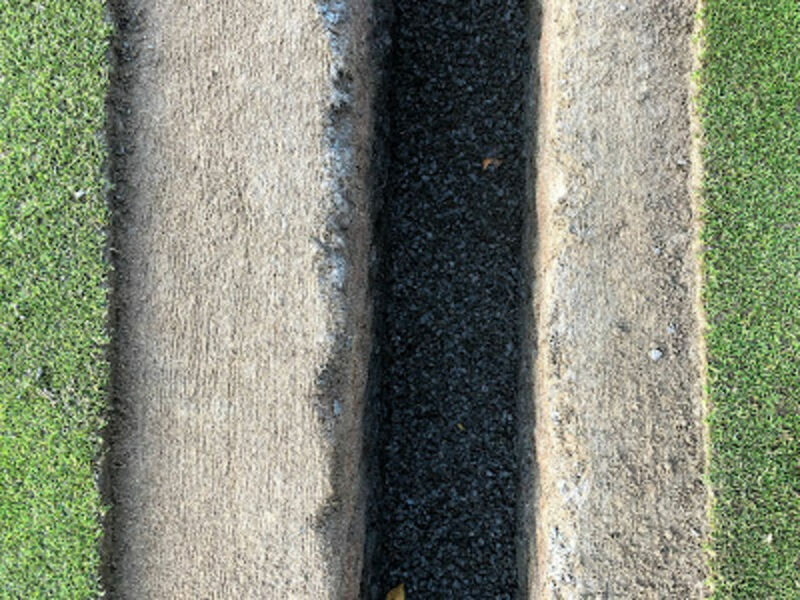 The picture on the left shows our worn out turf lifting iron compared to the new iron on the left. Its took many years to wear it down,and we were surprised when we compared it with the new one. 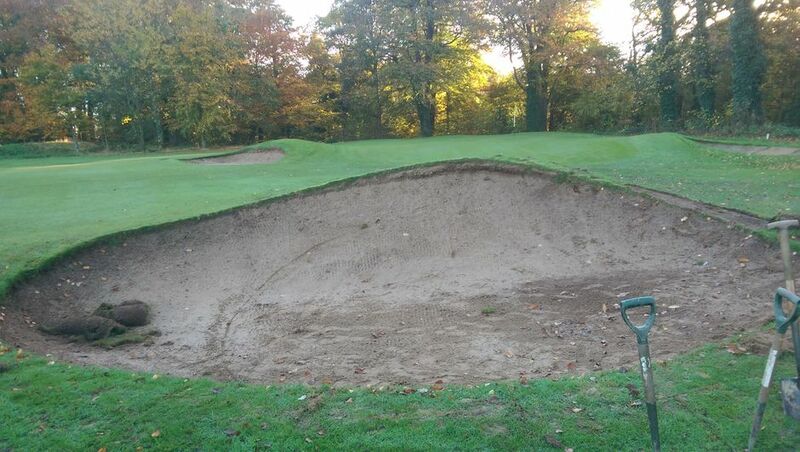 Work on the bunkers has significantly altered the size, with the sand particles reducing its shape!!! The picture on the right shows a large amount of Frog spawn in the pond at the side of the 11th green. Its great to see and is a good indicator for our correct management of the pond enviroment with the Birds Fish, Frogs, and plant life thriving in the area. 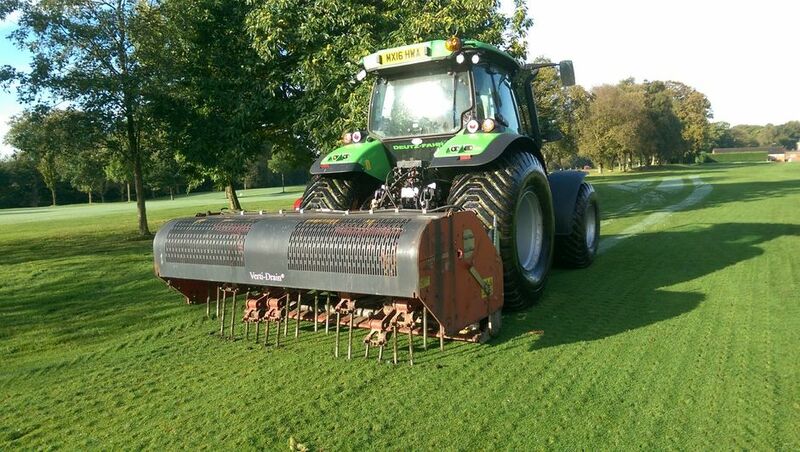 We hope to continue our aeration of greens, tees and fairways. Greens will be top dressed and a conditioner and wetting agent will be sprayed on to them. Bunkers will be edged and the divoting on the tees will be increased through the additional play. Welcome to our February update. 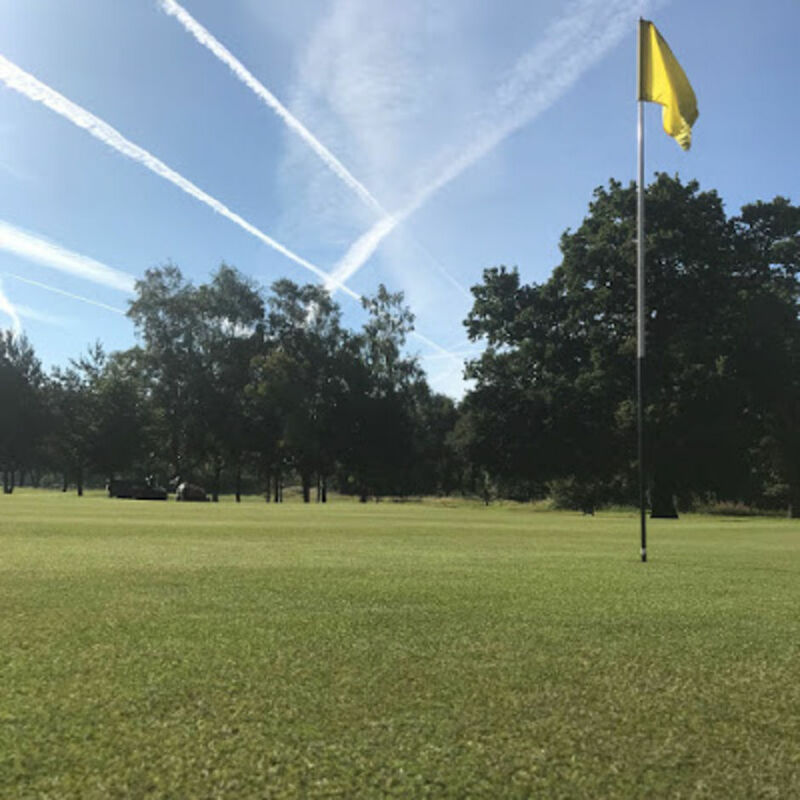 The weather pattern continued for most of the month giving us periods of wet weather and periods of frost, however we had a spell of dry conditions at the end of the month that allowed us to cut the fairways. 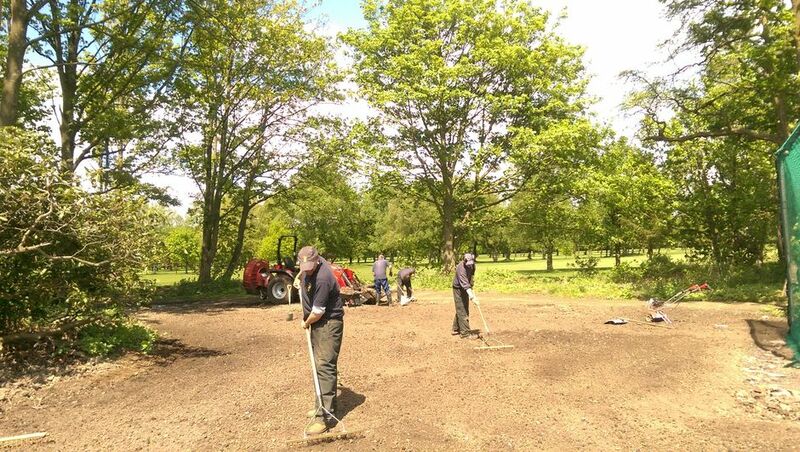 The firmer ground conditions allowed us to start topping up bunkers and adding shale to the paths around the course. We sprayed the greens and practice area with Soluble Iron to harden the plant and to control moss. It was quite noticeable how the course firmed up in such a short period of time, it got us thinking spring had arrived!!!!!!!!!!!! 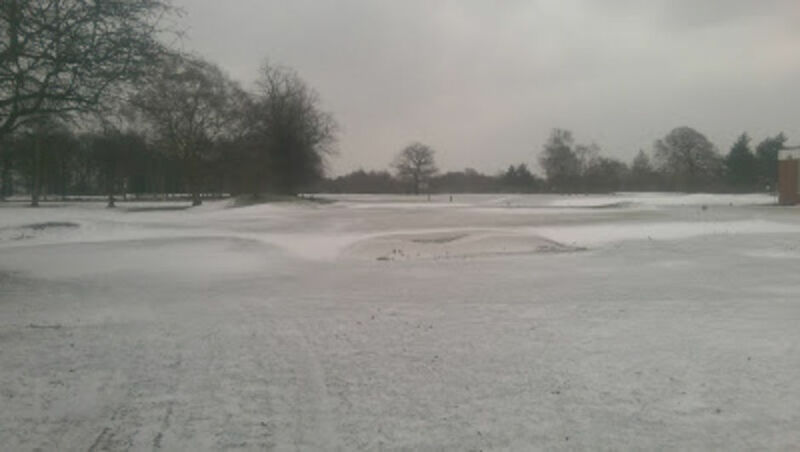 The picture above shows the surface of the 18th green covered in frost. 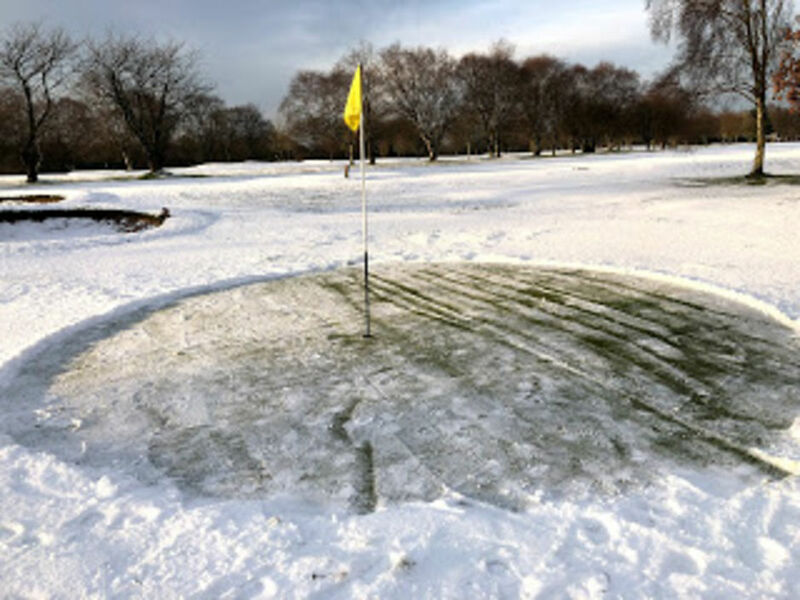 The link below explains why we keep off the greens until the frost as thawed. The area at the back of the 15th tee as struggled to drain as effectively as we would like. To achieve a better draining surface we used the hole cutter to take out a full core. We then shattered the lower profile to break up any compaction and then back filled with 2-8mm grit. 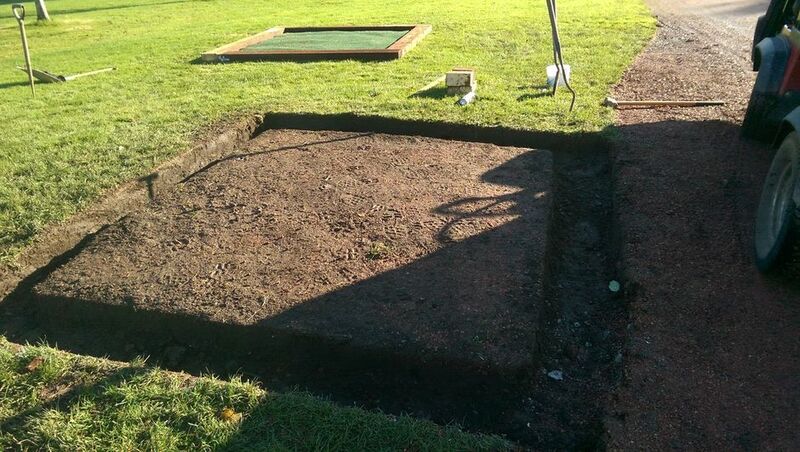 We will fill the holes with rootzone, turf and top dress ready for the start of the season. 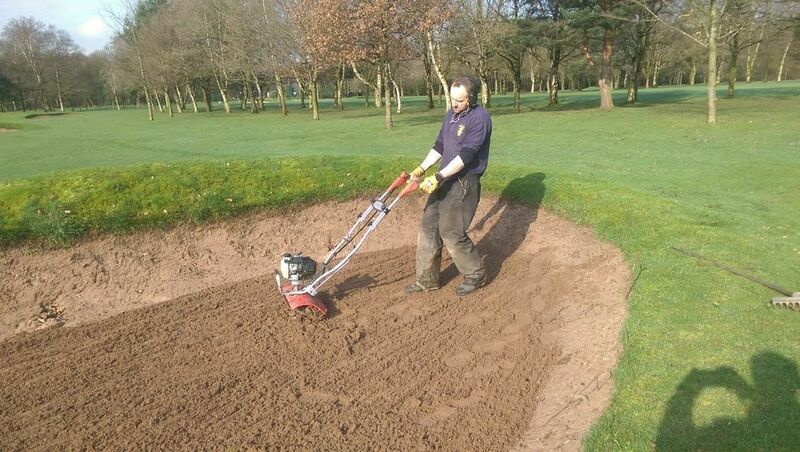 Lets hope for a good dry period in March, we aim to finish topping up the bunkers and finish shaling the paths. 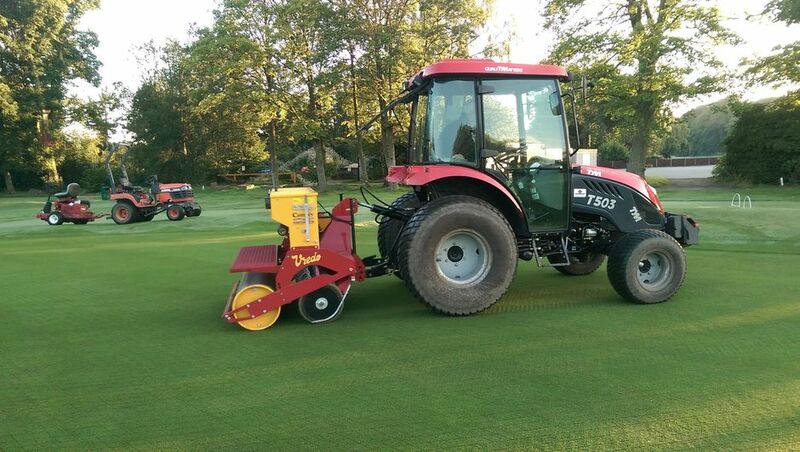 We will feed and vertidrain the greens and tees,and hope to start top dressing the greens. Weather permitting!!!!!!! !